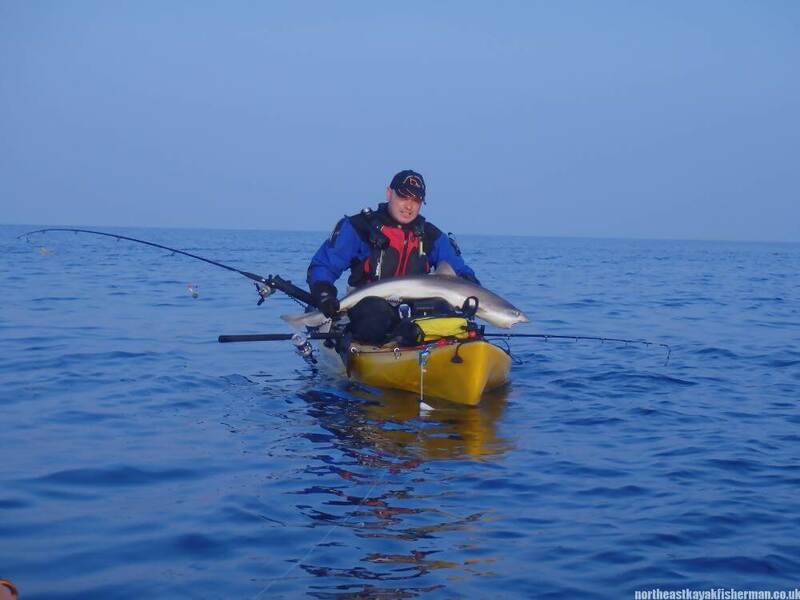 This was my second kayak fishing trip to the Mull of Galloway. The first was 3 years ago and it is something I had planned on doing every year over the bank holiday May weekend but bad weather put to rest the last 2 planned trips. However, mother nature looked favourably on Nathan and I this year. 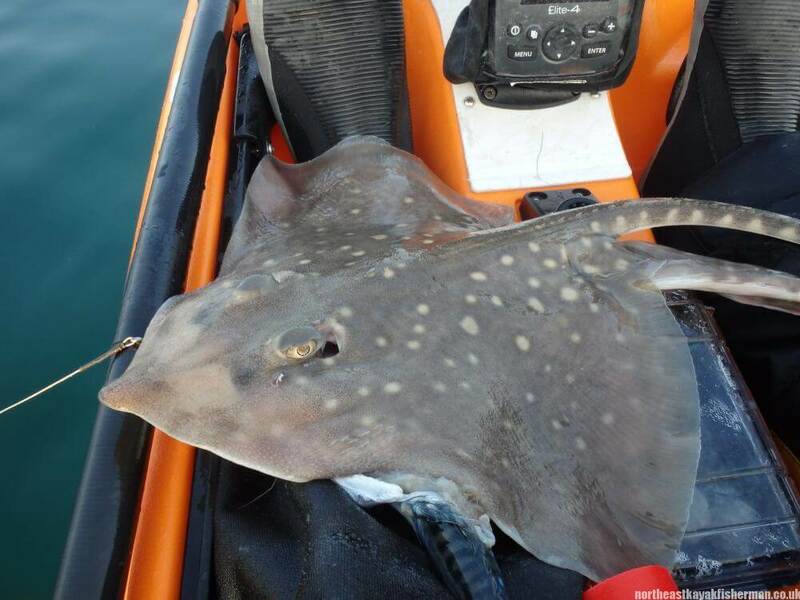 We were also keen to get our first tope. 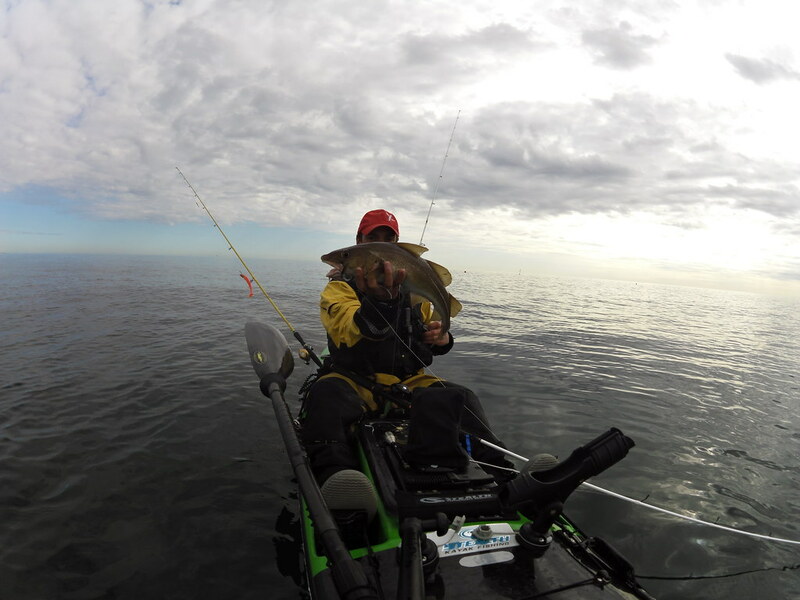 Nathan had a hookup on our first trip there which had him getting dragged about all over the bay but he never got it to the surface and ever since then I have been keen to get in on the action. 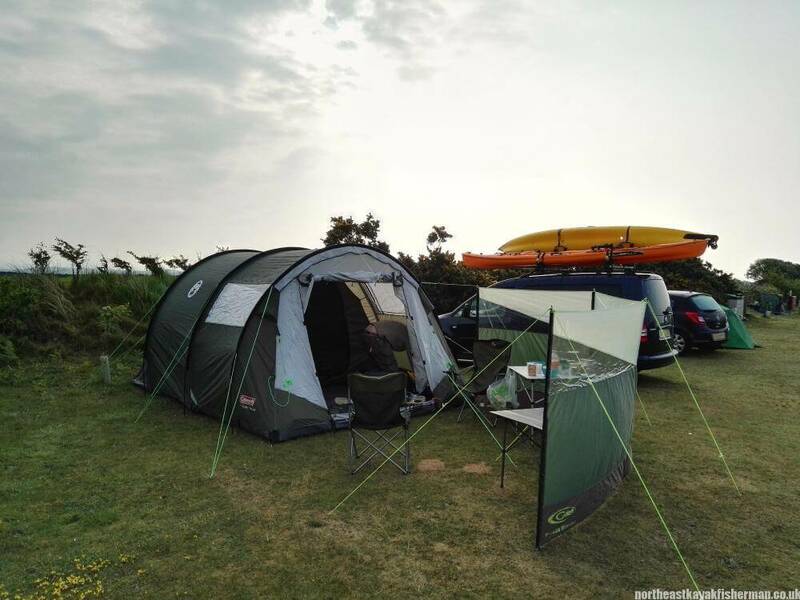 Could this year be the year…..
We set off after work on the Friday and headed straight across to the Sands of Luce holiday park at the base of Luce Bay. This was the first time I had camped here but I will definitely be going back. 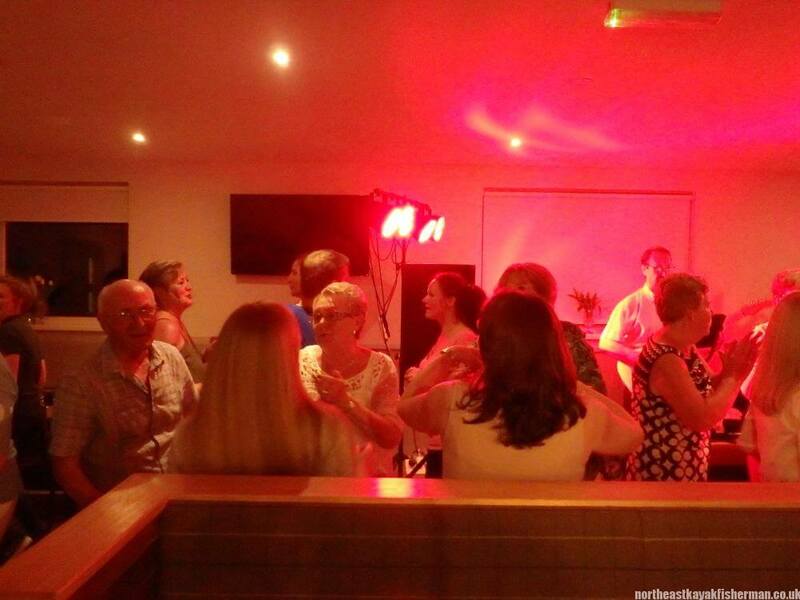 The park was clean and had been recently refurbished with a fun bar for food and drink in the evenings. 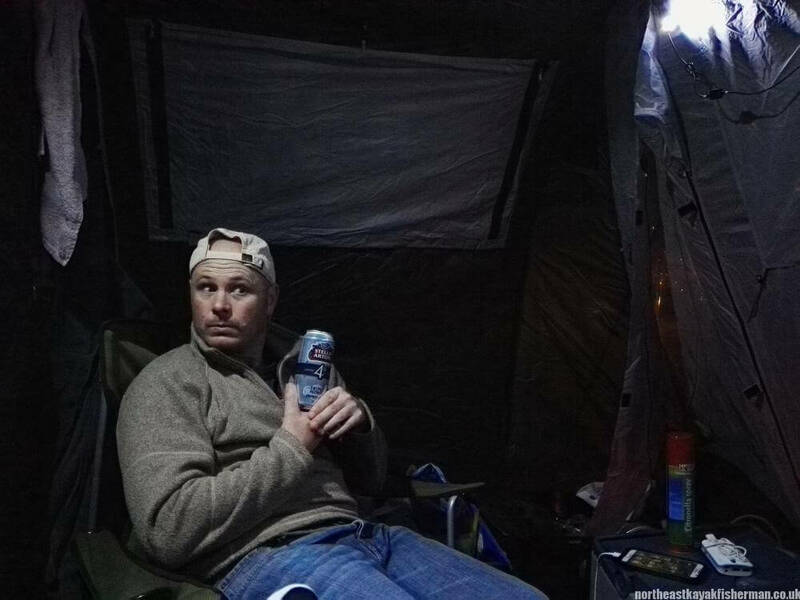 On arrival it was a case of quickly getting the tent up before darkness fell and then a few cheeky pints to help us sleep. The weather was lovely and the wind light which meant one thing – midges! They certainly helped us pick up the pace when putting the tent together. 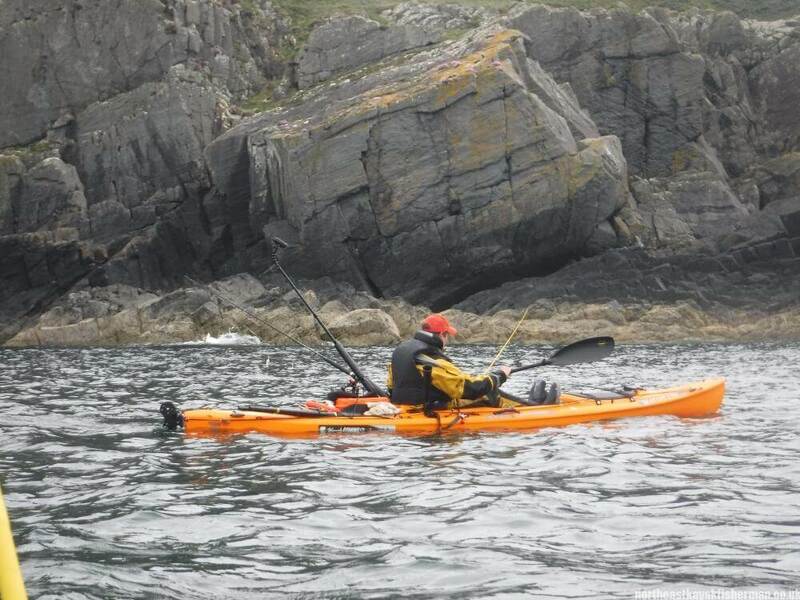 On Saturday morning we had planned on heading straight out to Luce Bay in a forecast light offshore breeze. However, as per 3 years ago, the weather here seems to have its own micro-climate. The wind was the opposite direction to forecast and 3 times as strong. 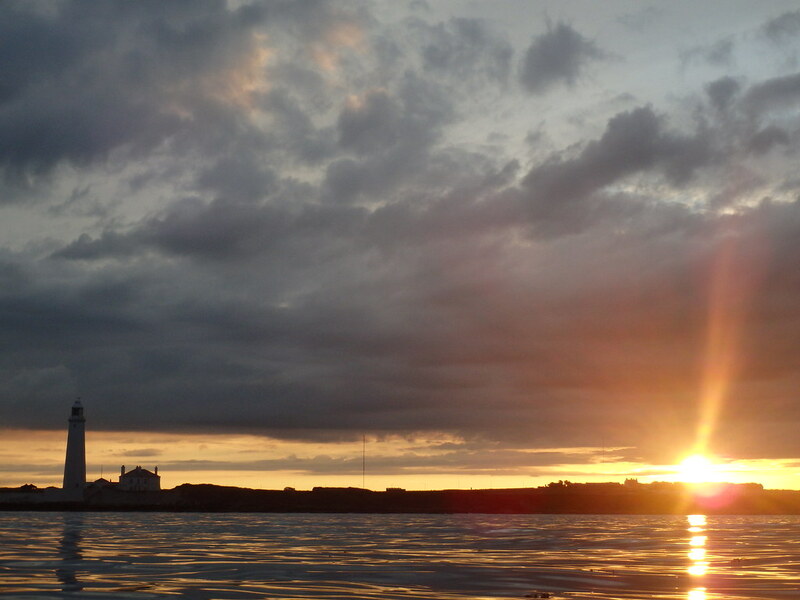 This called for a trip to Port Logan to fish in shelter under the high cliffs. It was no hardship as the scenery around Port Logan is brilliant. 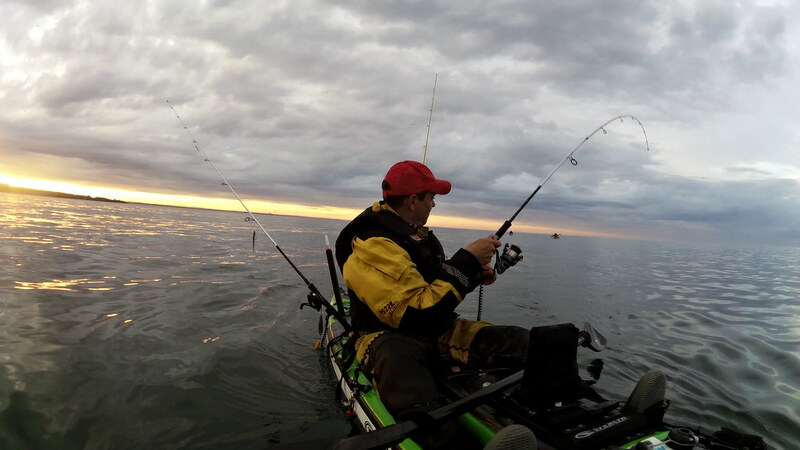 After a good 4-5 hours of fishing it was time to head in for some food and to see if we could re-energise to fish Luce Bay in the evening if the wind dropped. 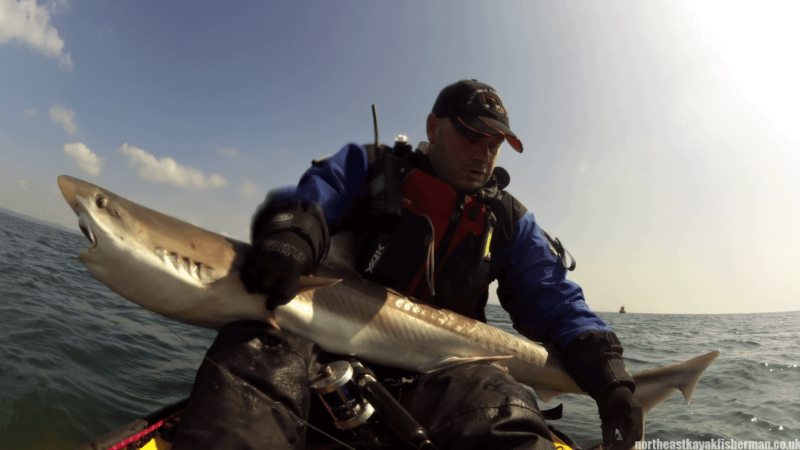 We had spent a lot of time searching for mackerel to use as tope bait but couldn’t find any. By 5pm on the Saturday, the wind dropped to almost nothing. It was sunny and really warm. 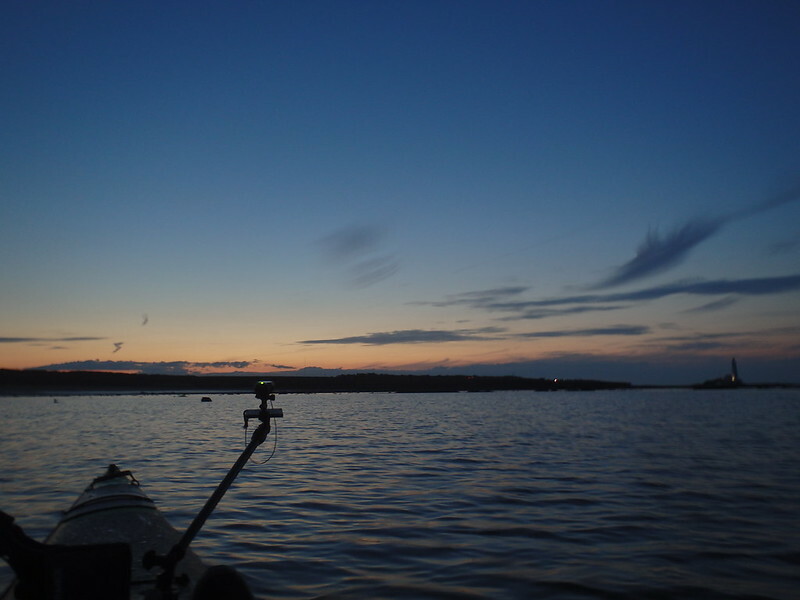 We almost settled for a few beers and a relaxing evening by the tent but the midges again, gave us extra encouragement to get back out on the water. 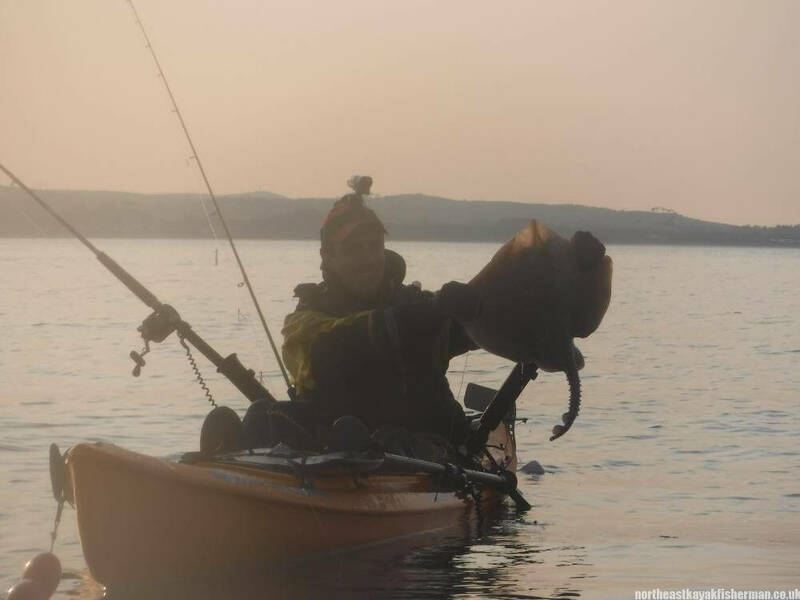 This time, bait fishing at anchor in Luce Bay was in order. We paddled out to a spot we had enjoyed success at 3 years ago. 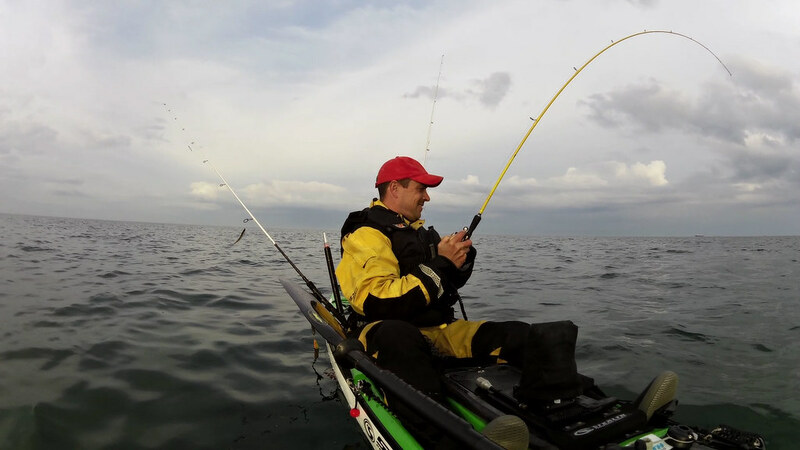 Once past the 30ft mark we found plenty of mackerel. It seems they were all in the bay rather than on the west side. 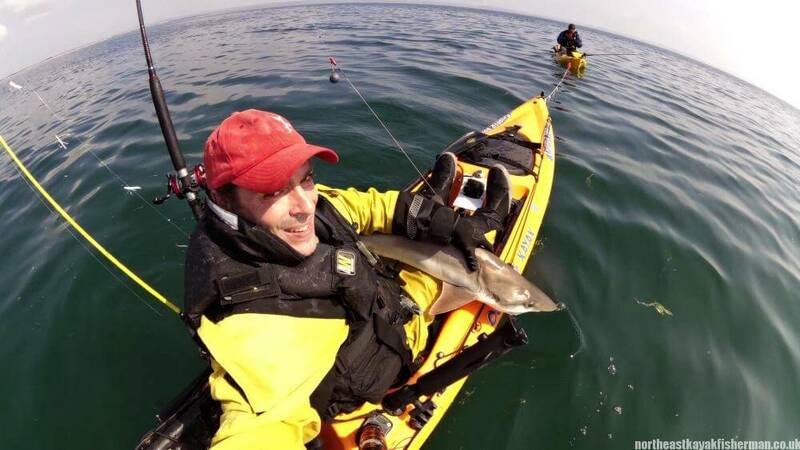 I began to think that this was boding well for the tope fishing. 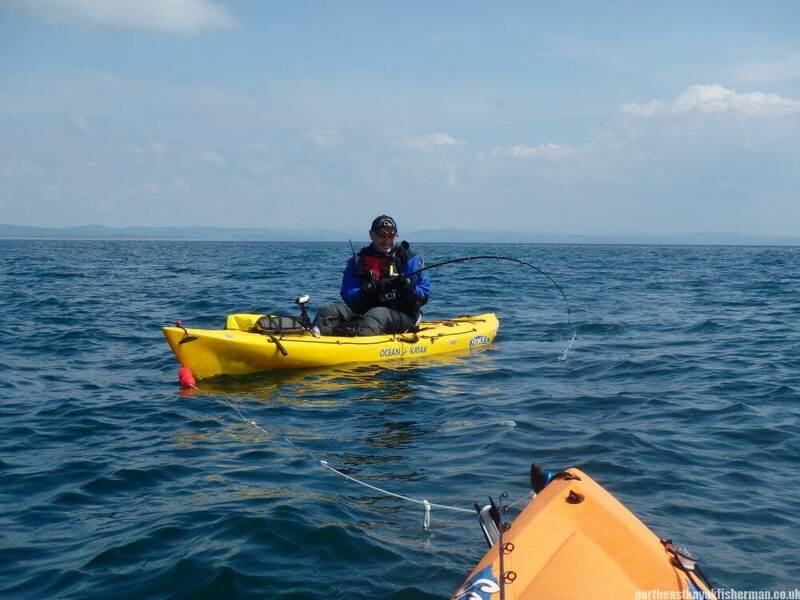 I dropped anchor and Nathan tethered next to me about 20 feet away. I put 2 rods down. 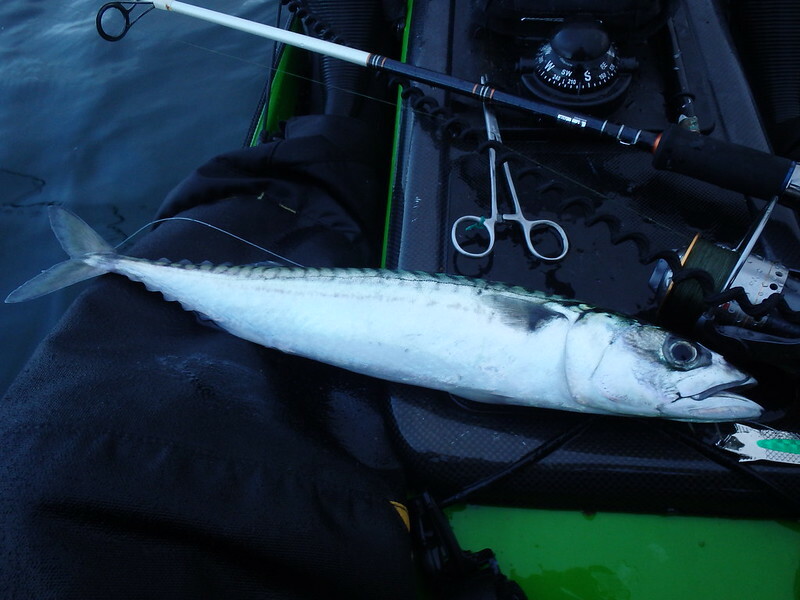 One with a mackerel on a barbless circle hook for the tope and one lighter rod with squid for anything else that might be about. Shortly after this, things went a little mental. 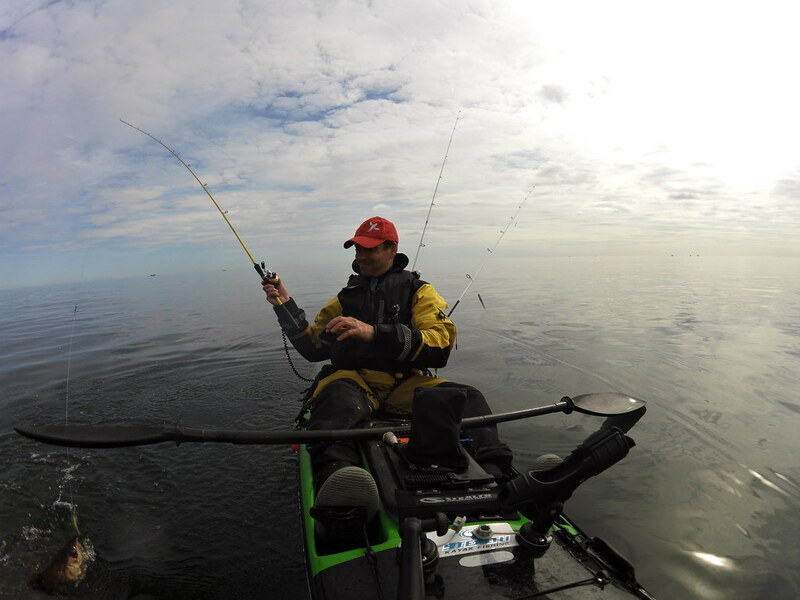 Nathan’s tope rod started taking line. Initially this was in stops and starts. Something was toying with him. Just as I was about to bring my tope rod in to keep things simple mine starting to take line. As if in on it together, we both had a fish on and chaos ensued. Nathan got dragged one way and me the other. Perhaps tethering was not a good idea! After plenty of adrenaline, we got both fish to the surface. Mine was not a tope after all but still a first for me. It was a bull huss. I can see why they call them bull’s. This thing had a serious attitude problem. I managed a couple of pictures but it was not very obliging and was returned quickly. 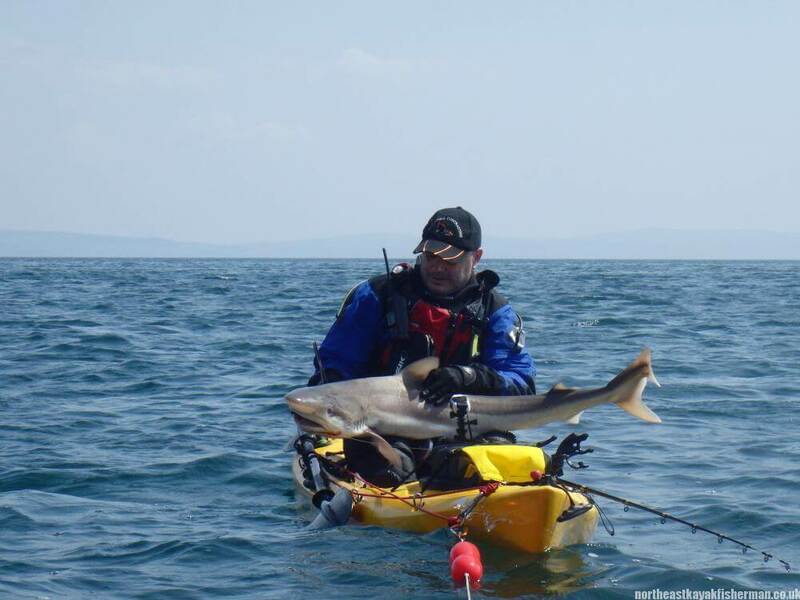 Nathan on the other hand had accomplished our mission and had a lovely tope at the side of his kayak. We had read up a lot on how to handle these but there is reading and then there is doing! 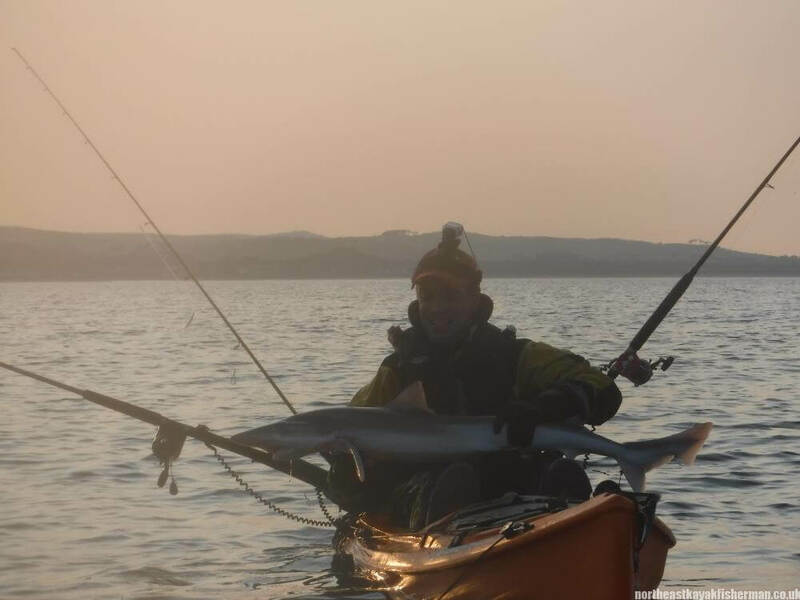 It was interesting to say the least getting such a large fish across the yak but Nathan did a grand job quickly unhooking it, getting some photo’s and releasing it from where it came. After this it became a bit of a species session. 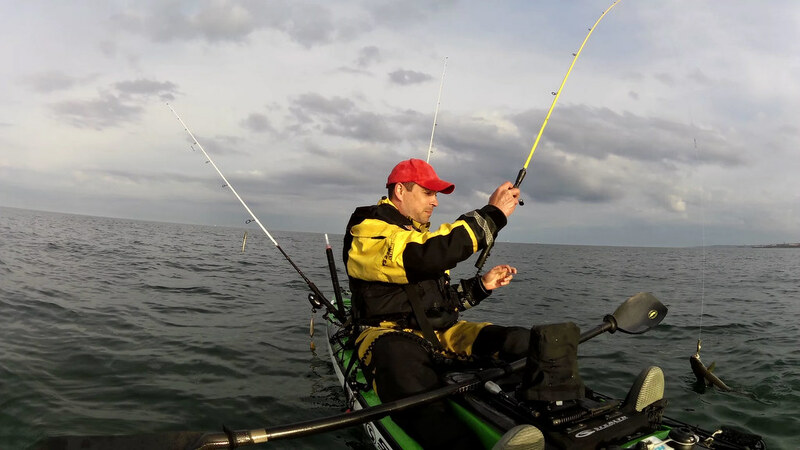 In the evening I had caught coalfish, pollock, grey gurnard, red gurnard, dog fish, thornbacks, mackerel and huss but no tope. 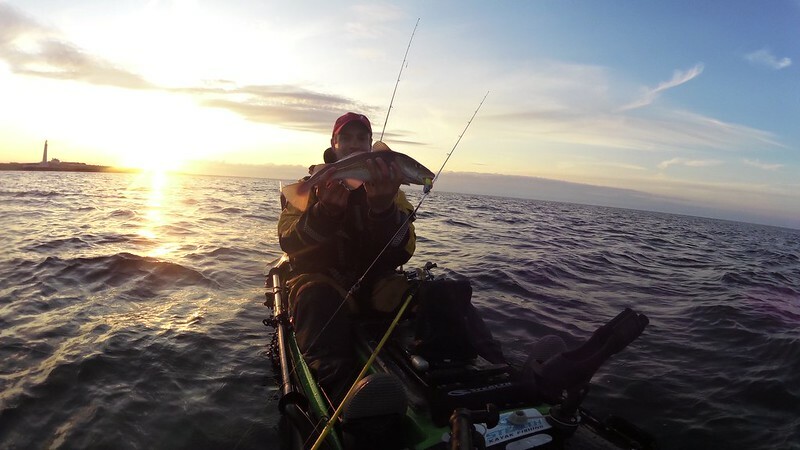 The sun was getting low in the sky and we decided to give it another 30 minutes or so before paddling in. It was now my turn for some action. Click, click, click went the Abu 7000. 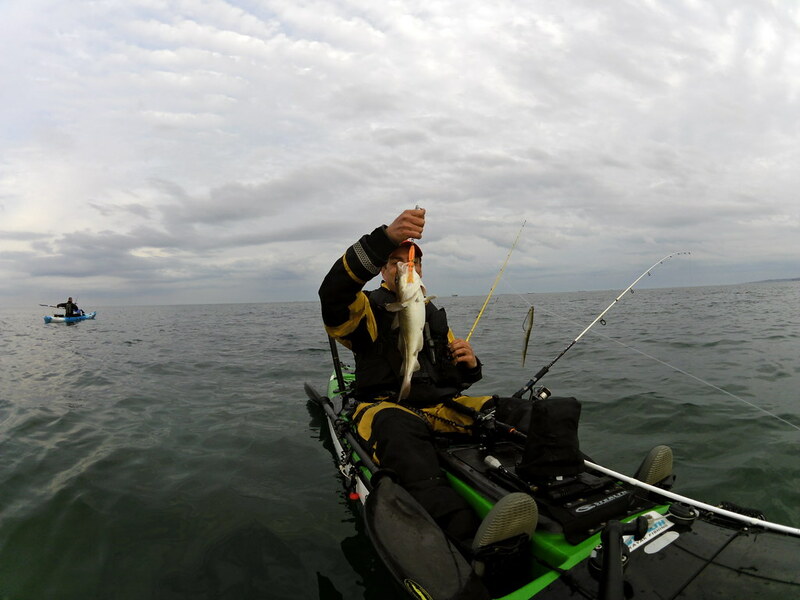 The clicks then got progressively quicker and louder and it was fish on! It felt very different to anything I had hooked before and was like an express train. I was grinning ear to ear and my heart was pumping. 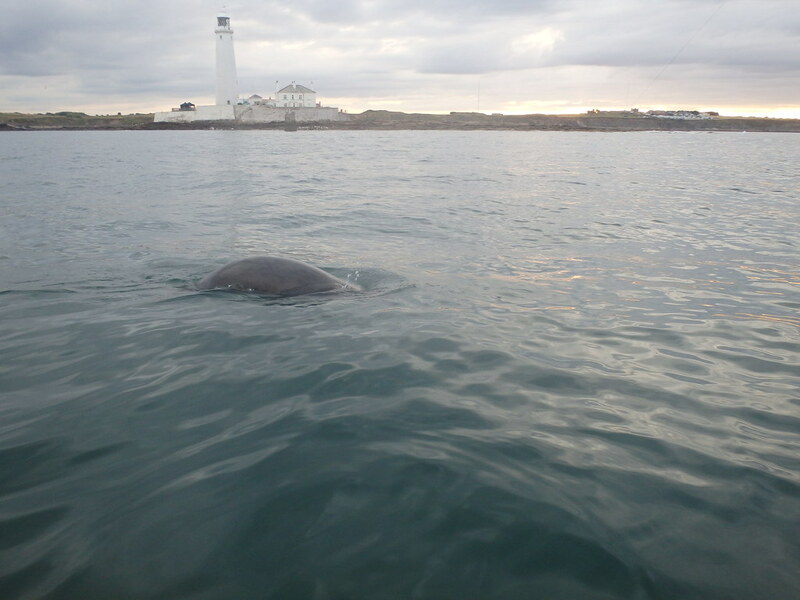 It surfaced 3 times almost like it just wanted to say hello before diving back down to the depths. 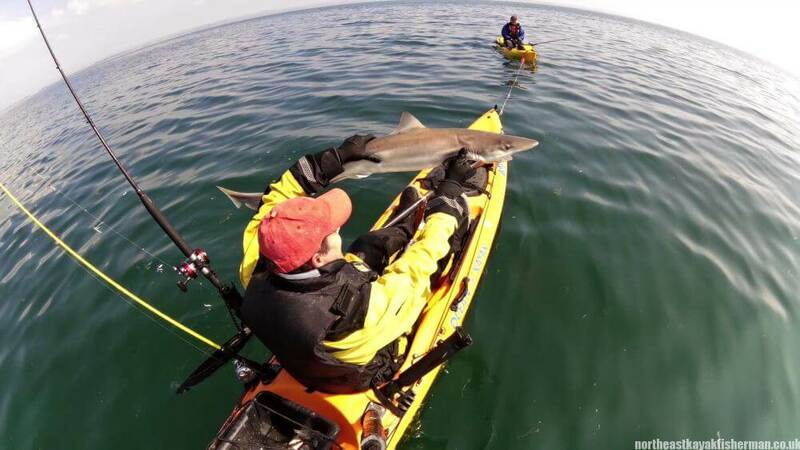 After 5 minutes the fight was over and the tope was ready to bring onto the kayak. That is what I thought anyway. 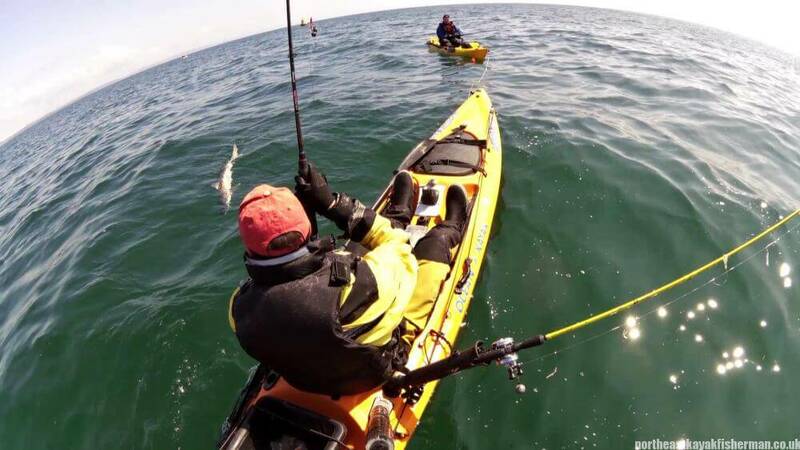 Once on the yak it became very lively. 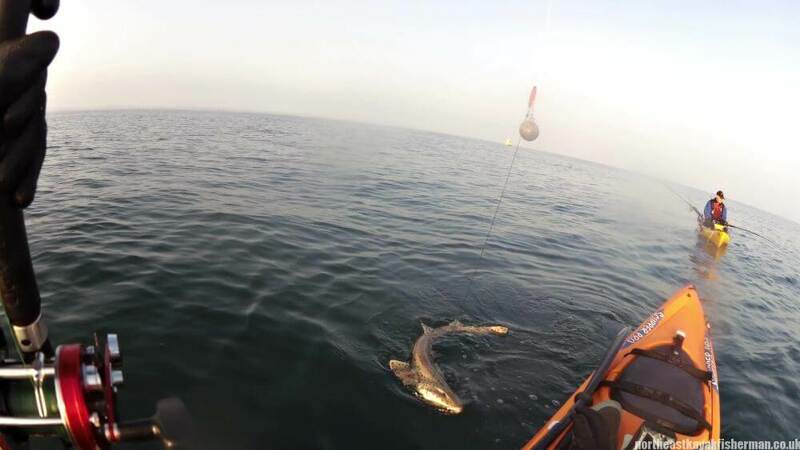 Still, I managed to unhook quite quickly, Nathan took a picture and it swam away strongly which was a great site. Saturday night we were in the mood to celebrate. The pub at the holiday park was suitably lively which was entertaining and once last orders were called a few more were had in the tent. It turned out to be the biggest of our trip. Does anyone want to suggest a size? I’m not confident in estimating this type of fish. Then it was my turn. I was becoming totally hooked on this type of fishing. 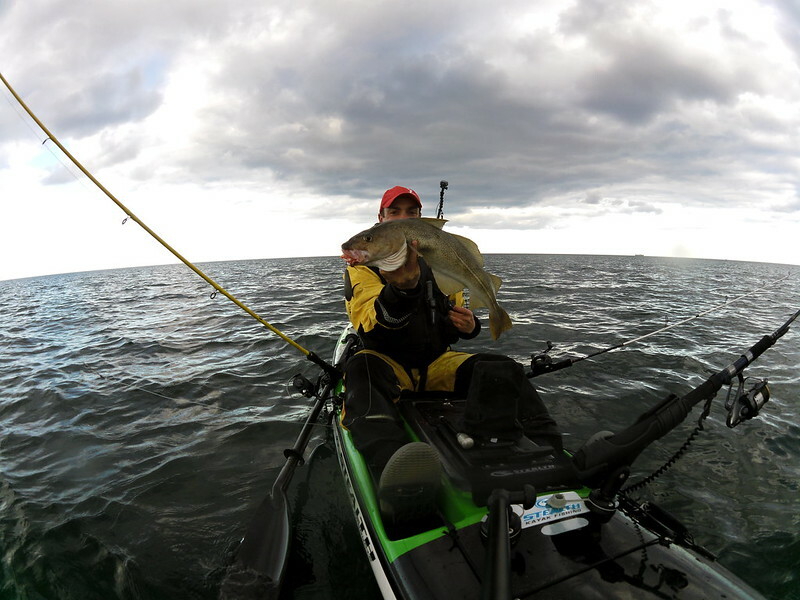 The sheer power of these fish and the fight was an absolute pleasure. 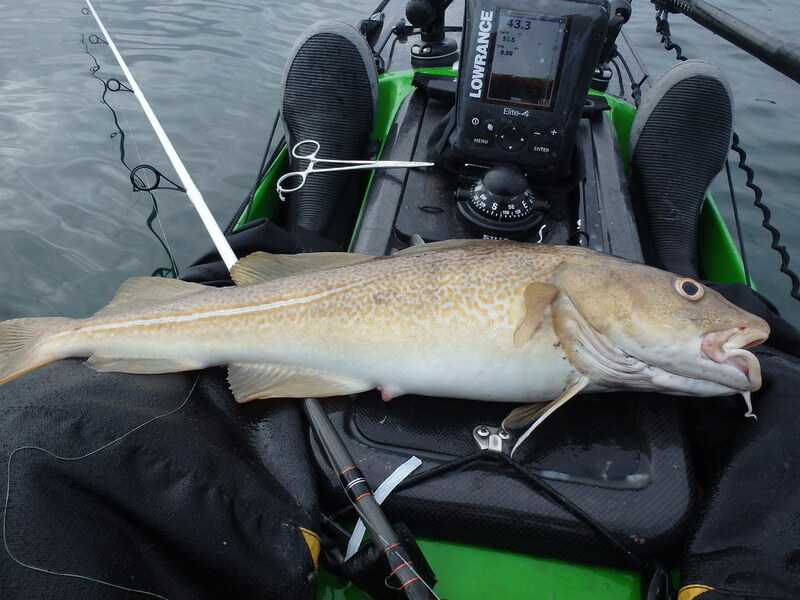 Cod and pollock fishing might never be the same again! At this point it was time to head back in to get the tent packed up before the long drive home. I was shattered but on cloud nine. I’m pretty sure I will have to make my way across again before the summer is up and look forward to the next years bank holiday May weekend. 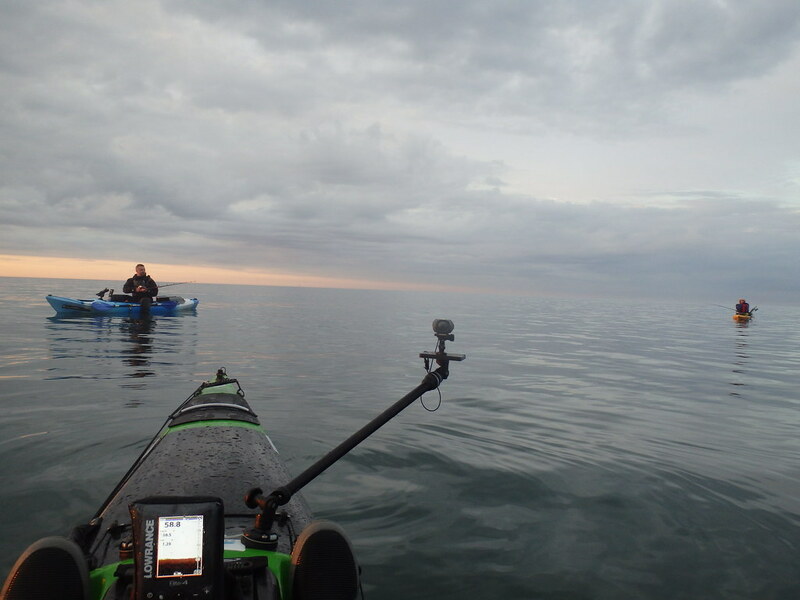 Andy, Kiwi (Nathan) and I headed out at Whitley Bay around 5.30pm last night with a plan to fish into dark and coming in around 10pm. Conditions were lovely, company great and fish obliging. 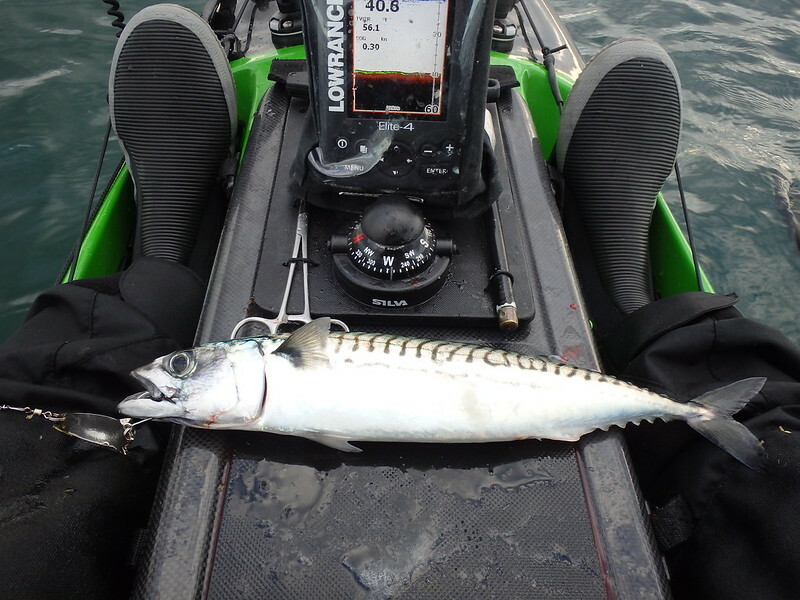 I struggled to find mackerel in any real numbers this season. That was until last night. They were everywhere! I stocked up on a dozen pretty quickly for winter bait (and some tea) and then firmly put the cod and pollock goggles on. The cod were there pretty much from the off taking a fancy for the fiiish minnow and slug go worms. No real biggie’s. Largest about 4lb. 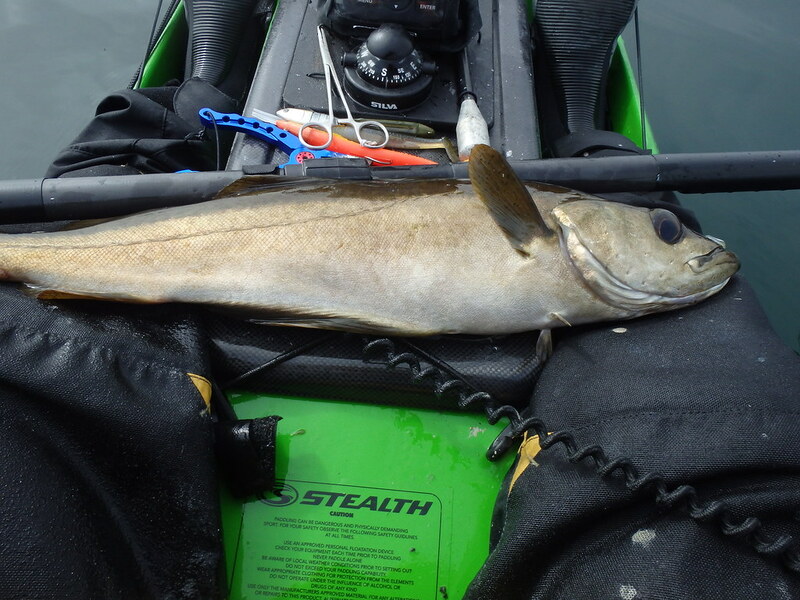 The pollock were harder to find but I did get a good one only to lose it right by the side of the yak. Still, the fight was fun. 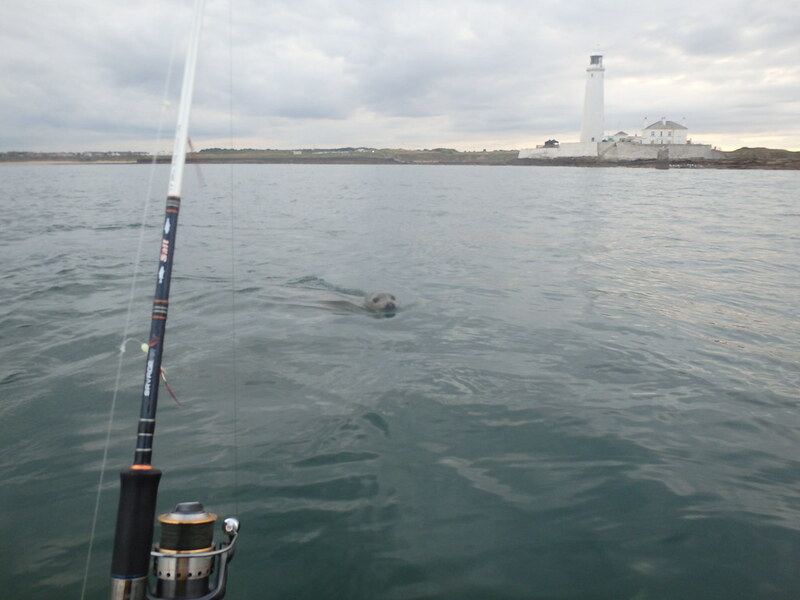 The seals around the island are getting more curious each trip. This time around they were being a right pest. I couldn’t fish my usual pollock marks as a result. 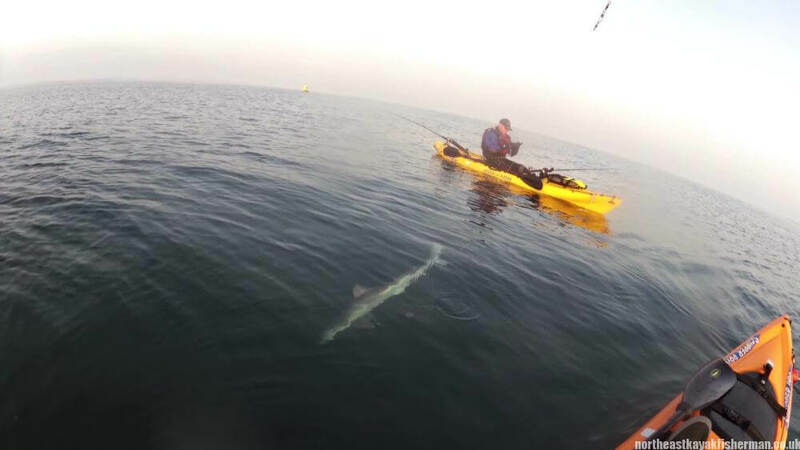 I could see them on the finder right underneath me taking it in turns to shoot up to the surface! 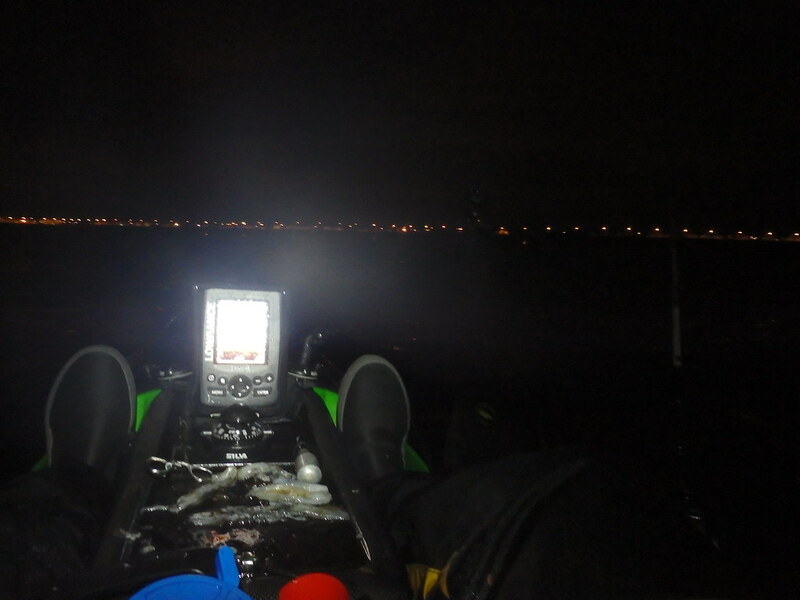 The night fishing was less productive. 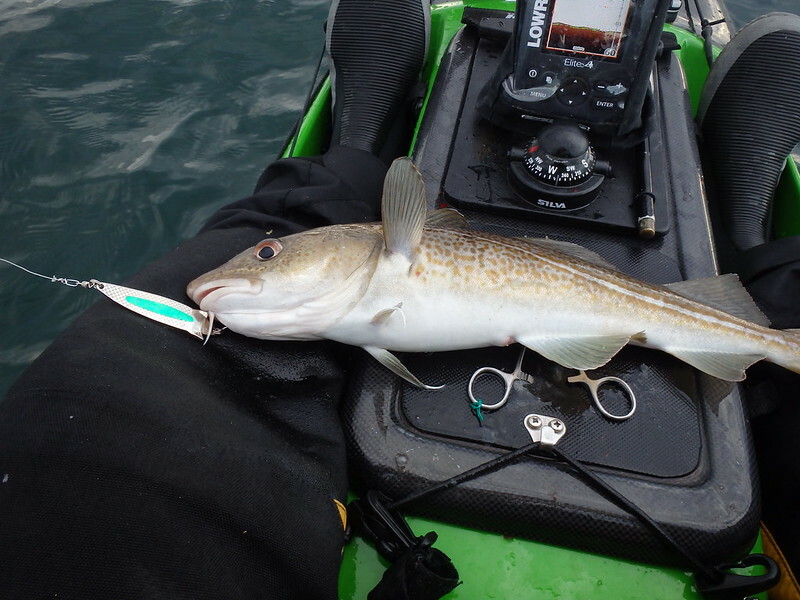 Cod were happy to take squid and black lug but no real size. Last night session I had scorpion fish and octopus so always hoping for something a bit different but it was not to be. 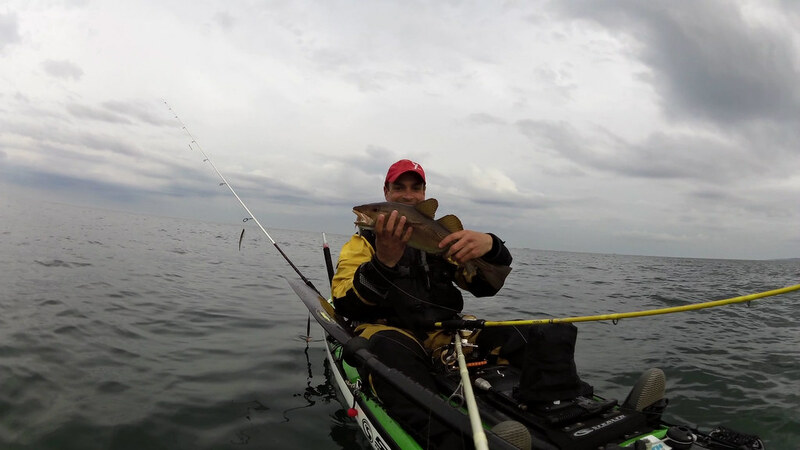 I managed a mornings session yesterday (24/7/15) before the weather turned. 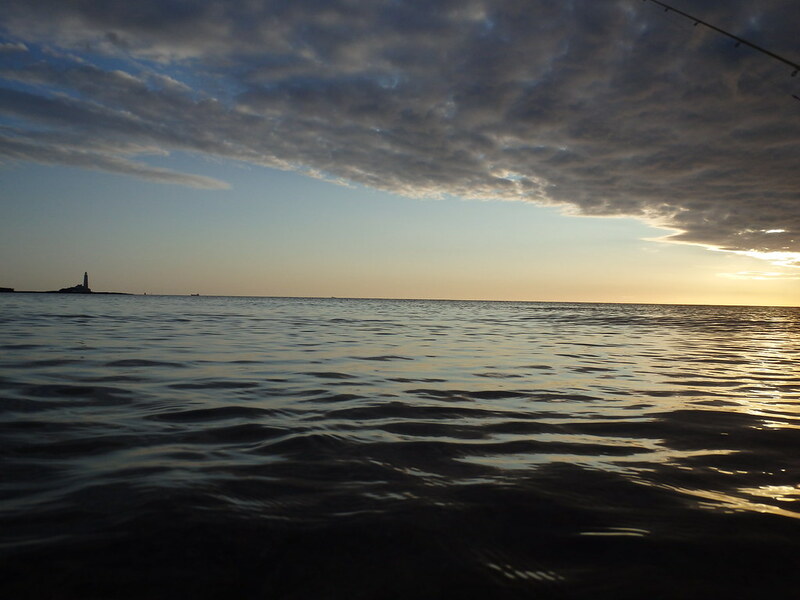 Forecast was for very light winds and with little swell for a few days clarity was also going to be good. The clarity part was right and for the most part the wind was light although it kicked up quite a bit towards the end. The wind always seems to make an appearance these days. 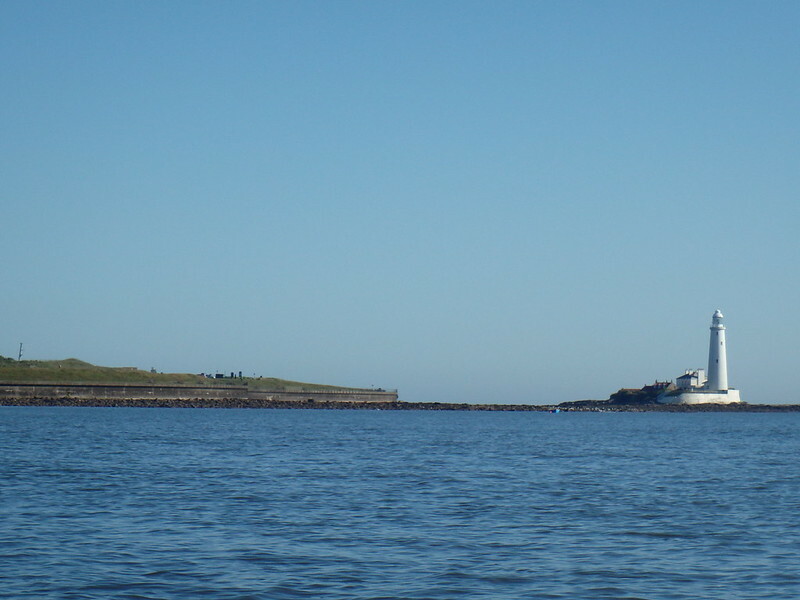 I couldn’t resist a couple of pictures of the light house before launch given how nice the conditions where. 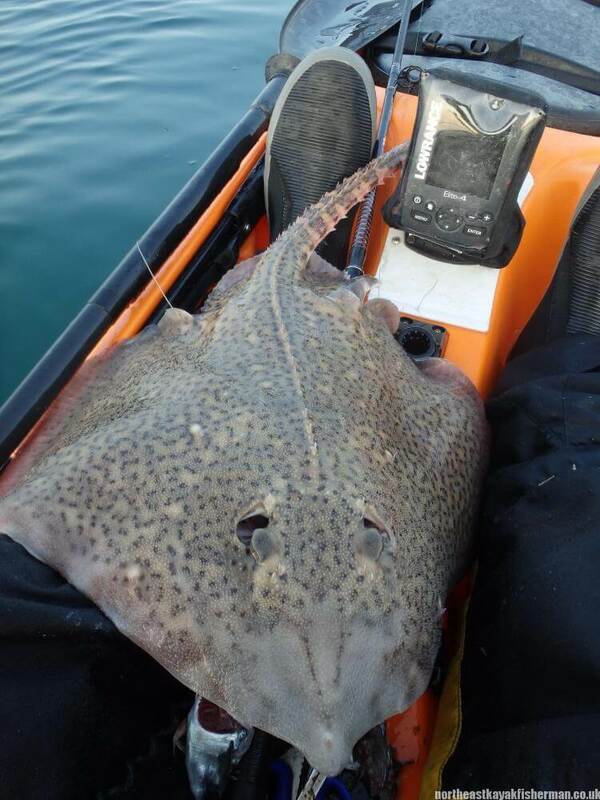 My plan was to get some paddle fitness in and mix it up a little and go for different species. I’ve not tried this specifically before but I’ve been spurred on by the great pics of the Oxwich species comp. 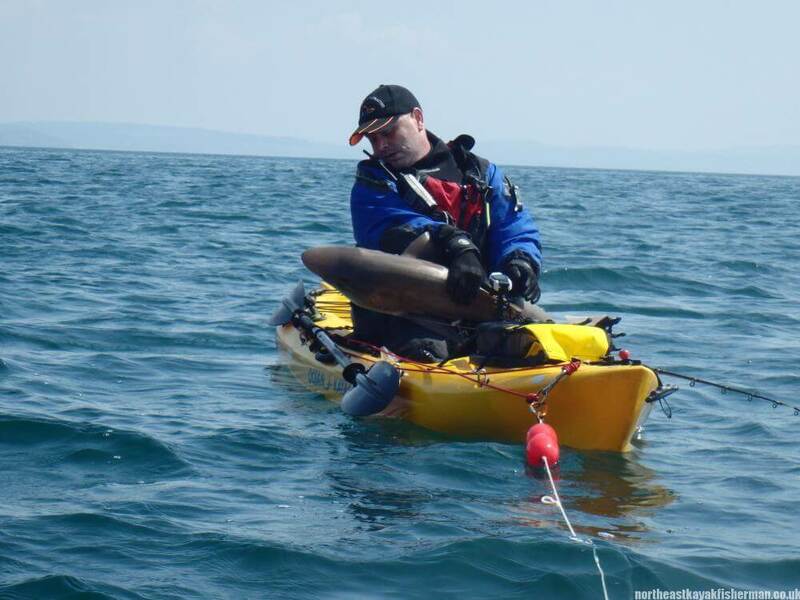 I initially planned to paddle the couple of miles or so straight up the coast to the sand bars at Seaton in search of flatties. I haven’t targeted these at all this year but really enjoy eating them! 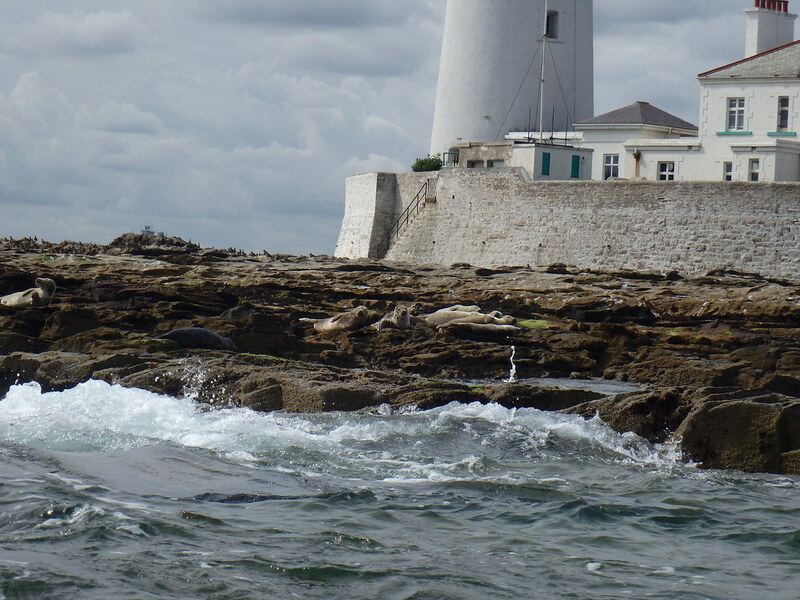 On approach to the light house I could hear the barking and roaring of the seals. The island is teeming with them at the moment including a lot of pups. I know some find them a pest but I personally love seeing them (as long as they do not get too close!). 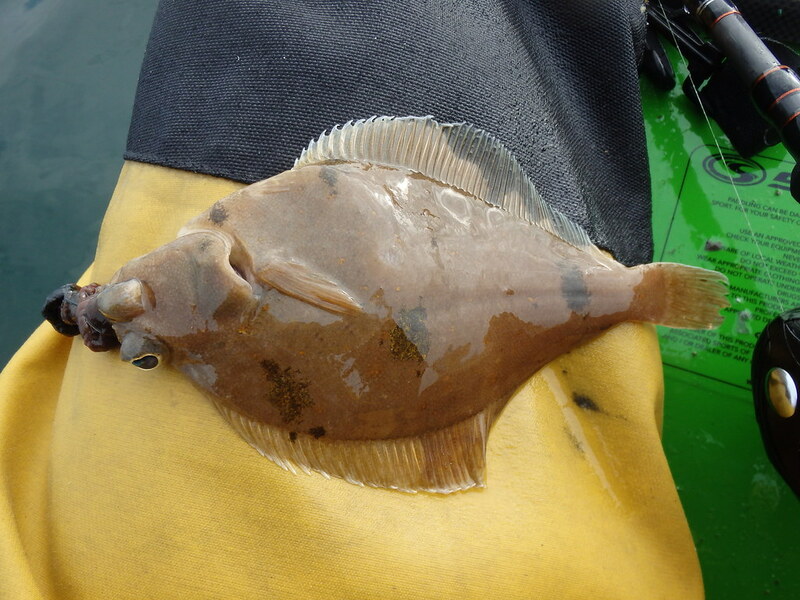 It must be a sign of good fish stocks but it cannot help fishing when they are only a few feet away! This area screams Pollock and temptation of starting fishing before the flatty ground got the better of me. A quick cast out into a favourite spot of mine and bam, straight in! 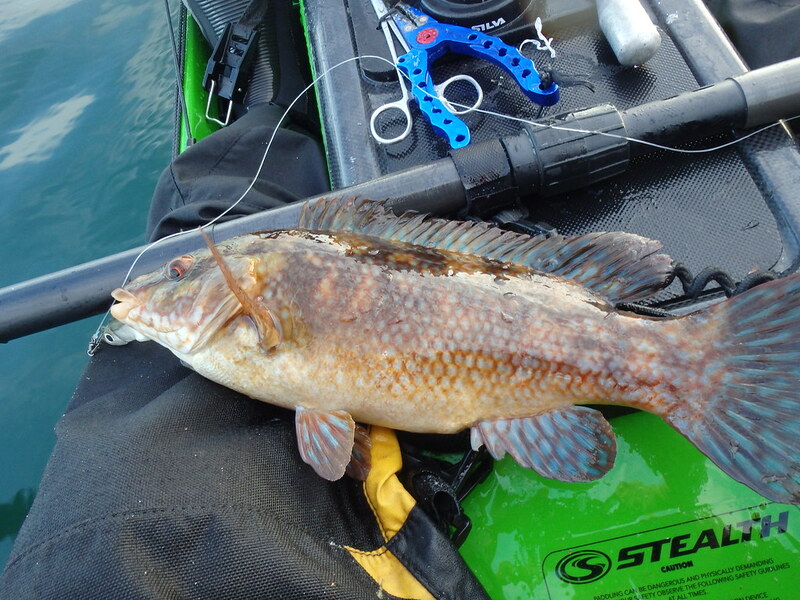 Not a Pollock though but a nice Ballan Wrasse which fell to a 12g Black Fiiish Minnow. 1 species down. 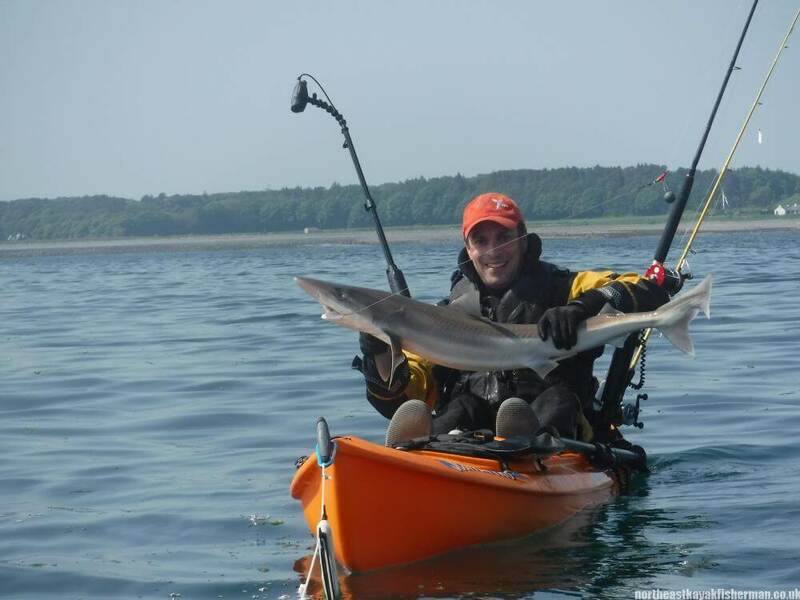 I had a couple more casts but then managed to get back to the plan and continued to paddle to Seaton Sluice (but trolling a lure in case a hungry Pollock was about). 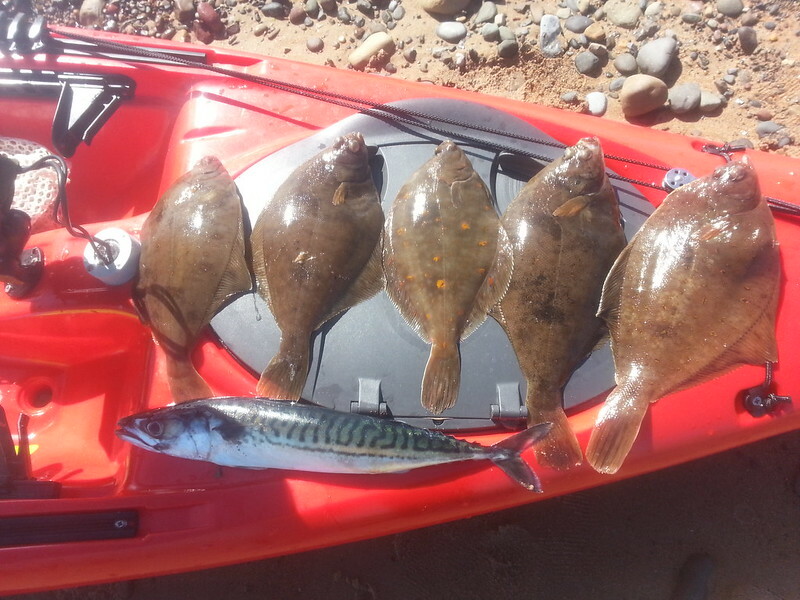 On arrival to Seaton Sluice it took me a little while to find a nice sand bar and then I set about drifting spoon rigs. 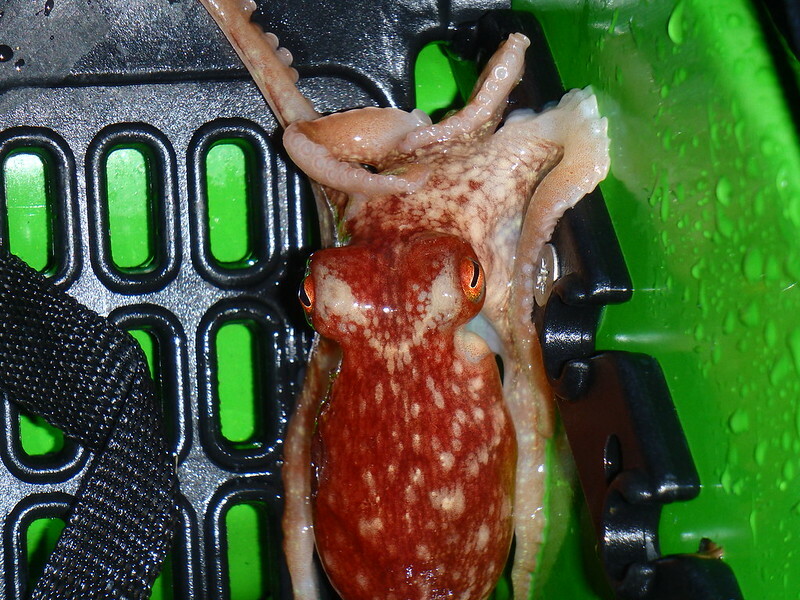 One had black lug tipped with squid, the other a white XL Isome Worm. I was keen to see how they compared. The flatties were very obliging. Nothing big enough for tea but half a dozen caught (mostly dabs with the 2 plaice) before thoughts of rough ground started. 2 fell to Isome worms. 4 to black lug. 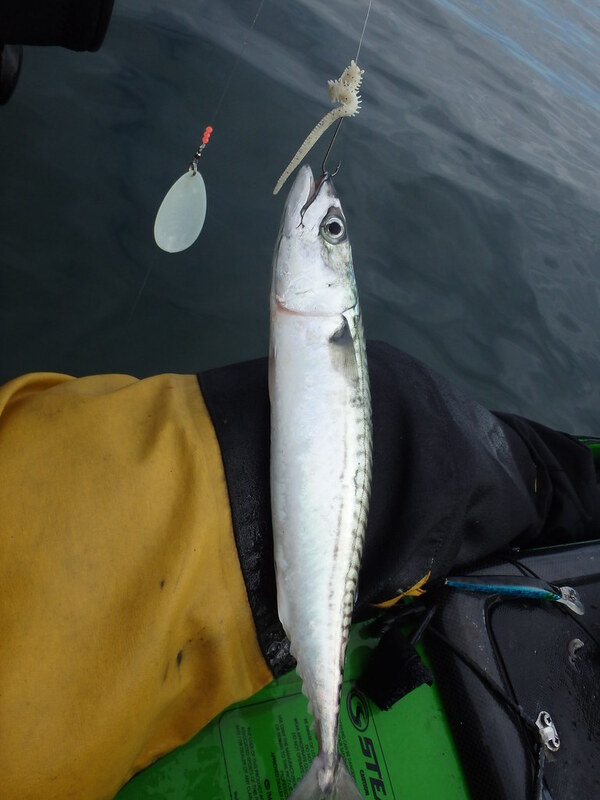 I also caught a couple of mackerel which took it to 4 species. 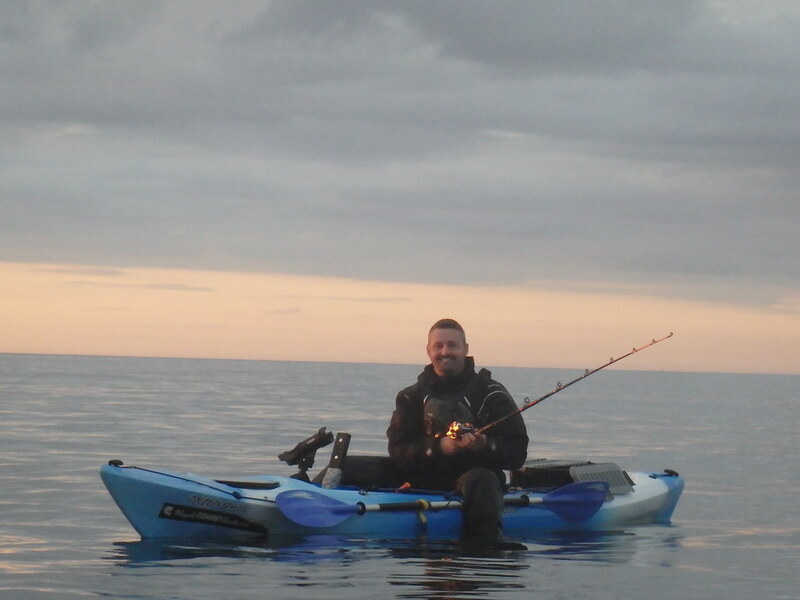 I then paddled to some ground near Hollywell Bay that grabbed my attention on the paddle across to Seaton Sluice. First drop with an inline 4” slug go and bang! 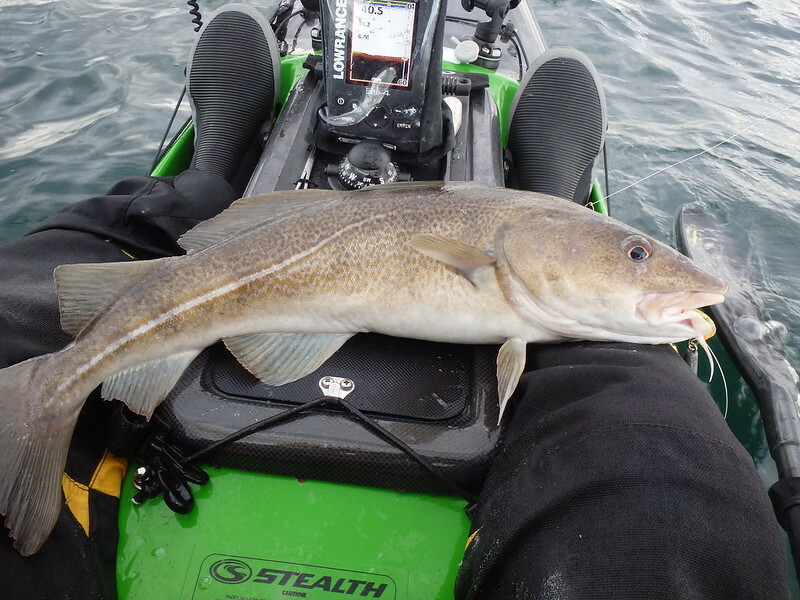 A good cod of about 4lb came to the surface after a good fight on light gear. 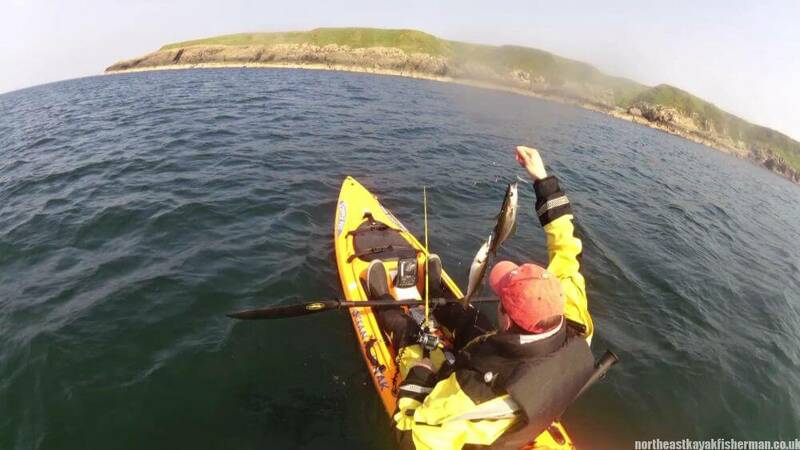 This action continued for about half an hour with a cod a drop. Some were pretty small but good fish were amongst them. I also tried the HTO Artic Eel for the first time in rhubarb and custard. 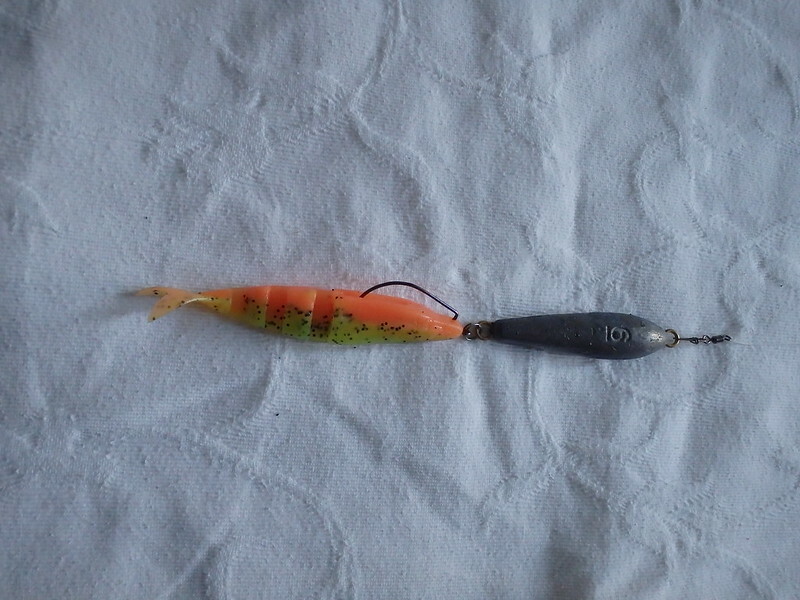 This is a weedless lure similar to the Fiiish Black Minnow but slightly cheaper and has a built in rattle. 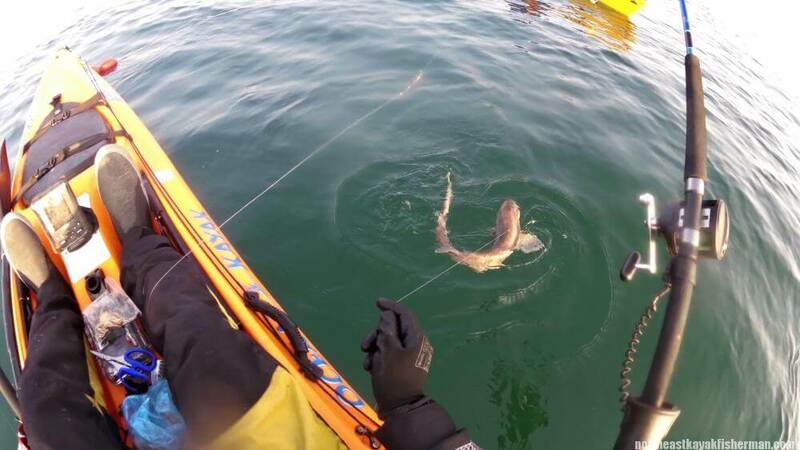 In addition, it is longer and thinner with the hook running further along the body. 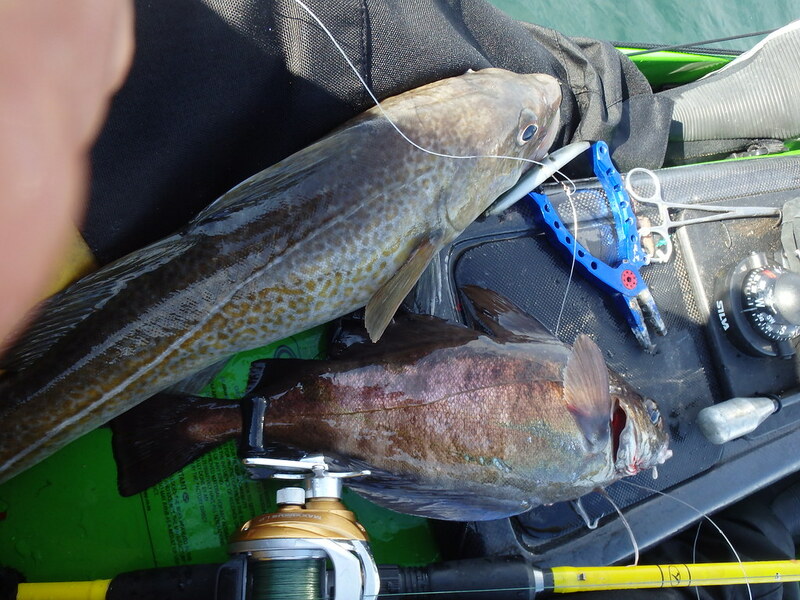 They worked very well for me for cod and pollock and I look forward to using them again (see vid). 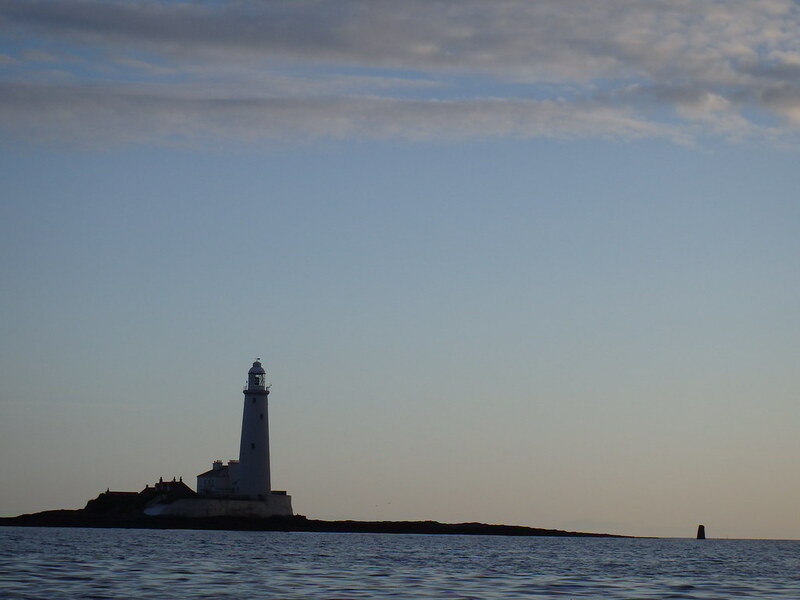 On the drift back towards the light house I had a couple of surprise hits. 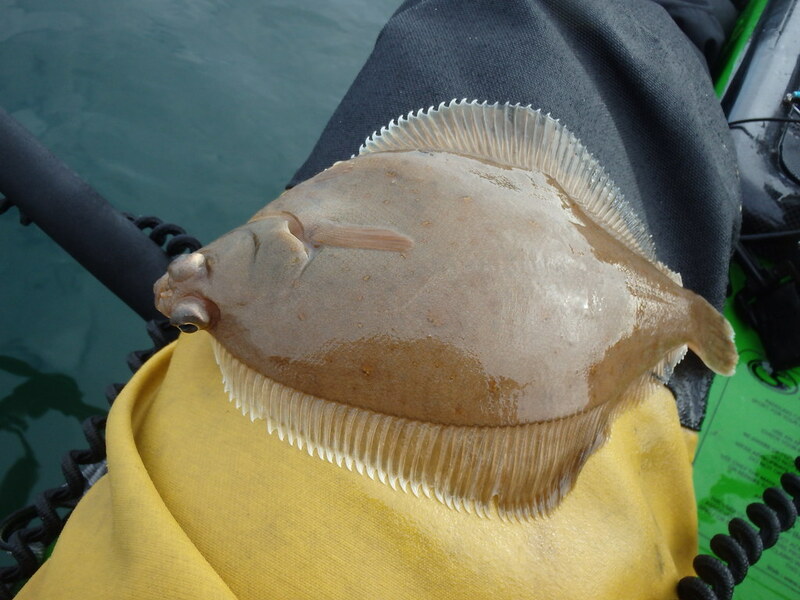 Two pouting / scotch haddock fell to my lures. 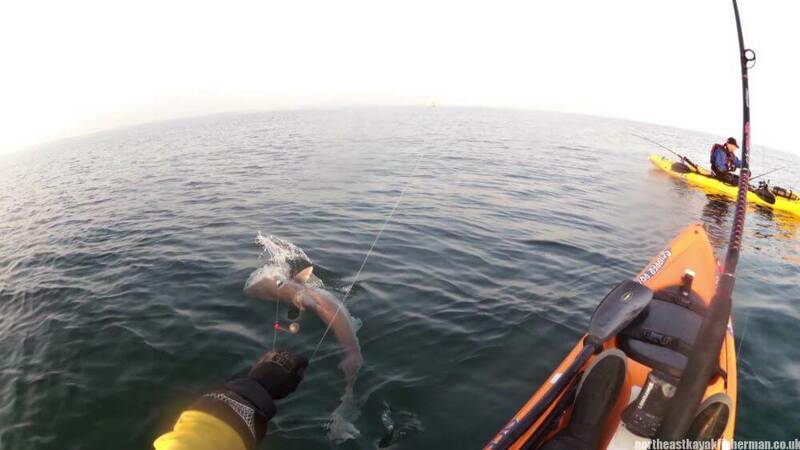 I have caught these around yellow can off Whitley Bay before but not in this area. They were also PB’s for me. One had thick brown bands running down its body. The other was solid brown with no bandings. Are these the same species or can I add another one to my list? Any info appreciated. 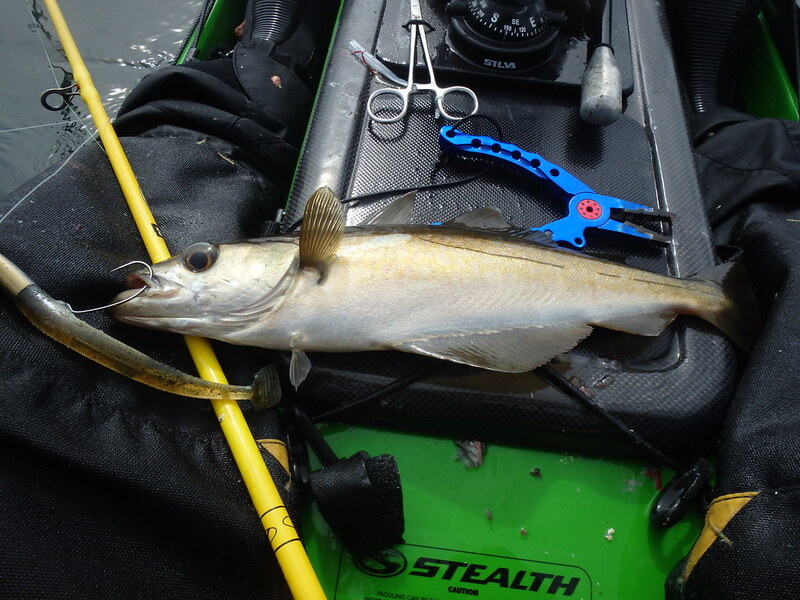 With 6 species under my belt I wanted a Pollock. These had been a little thin on the ground over the last few sessions with only 1 or 2 being caught after quite a bit of effort so I wasn’t sure how this was going to pan out. Fortunately, luck was with me today. 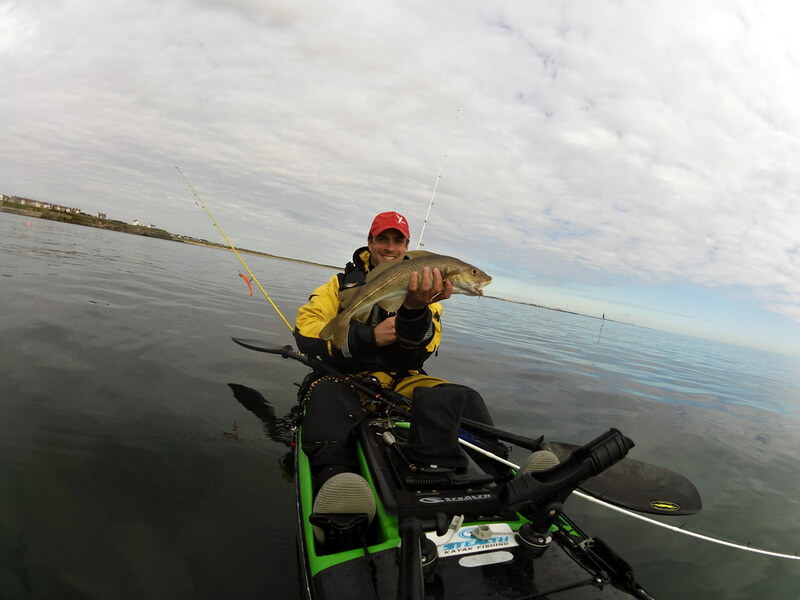 I switched to a more natural HTO Artic eel colour (the “Grippan”) and paddled to some thick kelp beds that I have had luck in before. I didn’t have to wait long before I was in with a good size Pollock. I love these fish and cannot get enough of the fight they give. There were a lot. 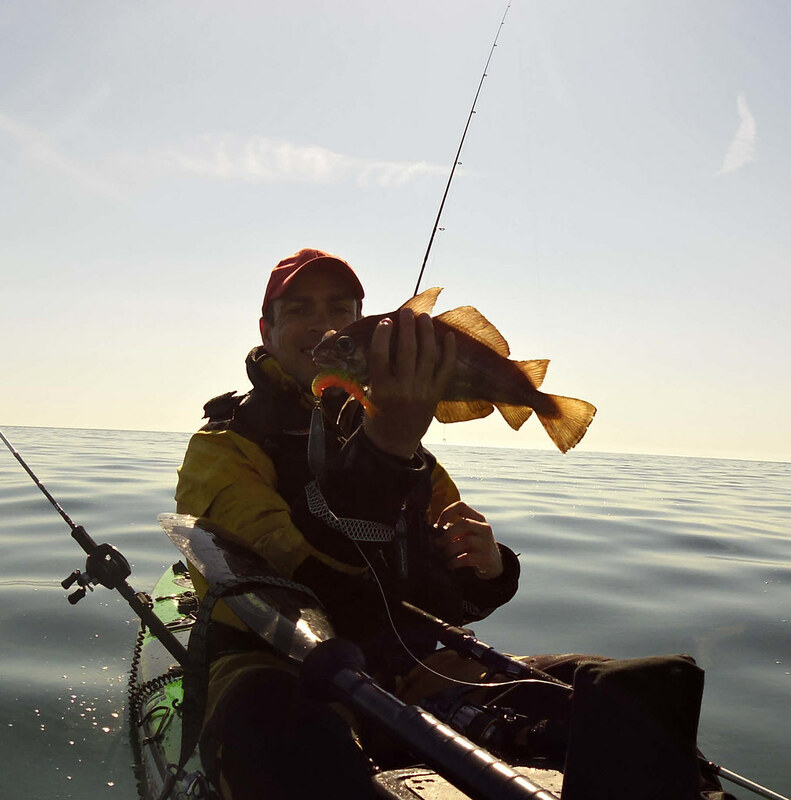 On almost every drop or cast and retrieve you could see one following the lure on the fish finder. A lot of big smiles and grins from ear to ear followed as 3 more came to the yak but none bigger than the first. 7 species done and it was time to head home. That fix will keep me going for a while. 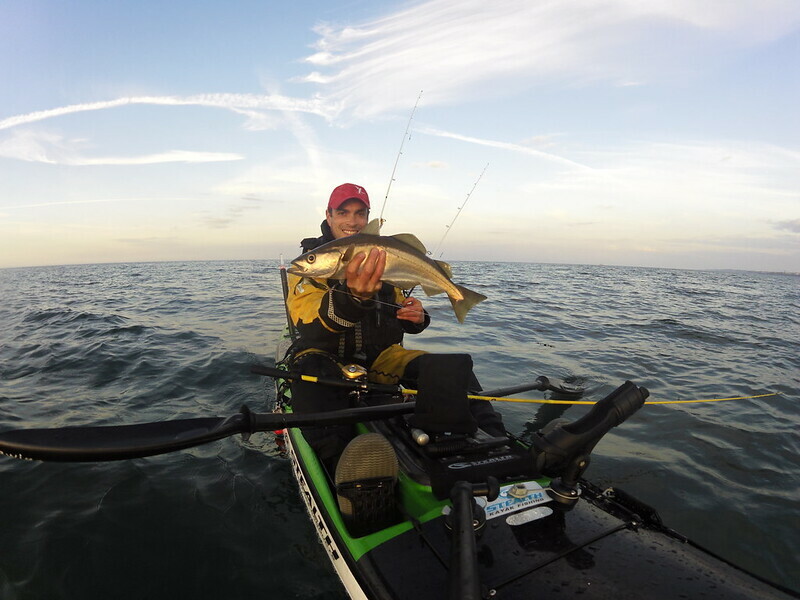 What a great hobby of ours Kayak Fishing is. 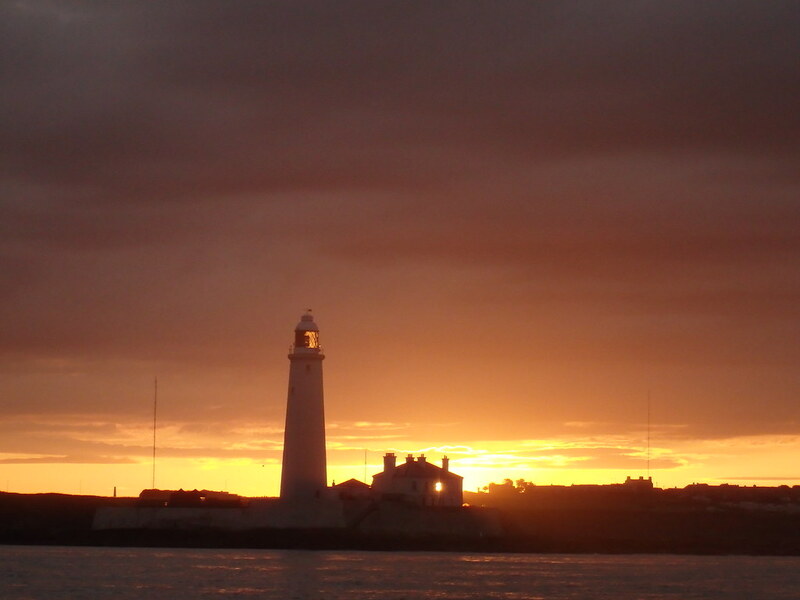 I got out at…..yes…..you guessed it…..Whitley Bay last night from 7:30 until dark. 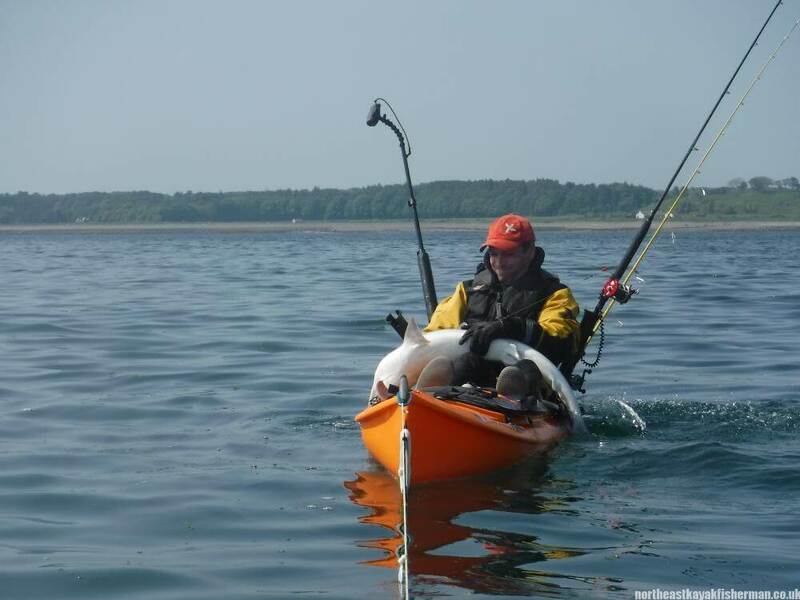 It was breezy but the drogue worked perfectly. I’m using this more and more with the windy spells we have been having and would recommend one to everyone who likes fishing on the drift. Fishing was slow but I did get 5 species which I was happy with. 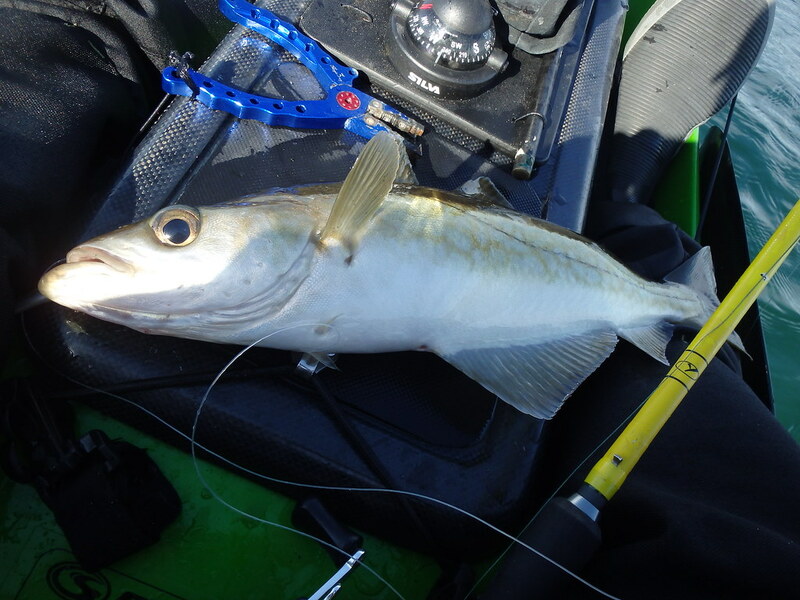 First of was a cod in deeper water. I then headed close to the light house and after approx 1.5 hours of constantly missing takes and having 2 big battles which I lost I finally got species number 2, the Pollock. 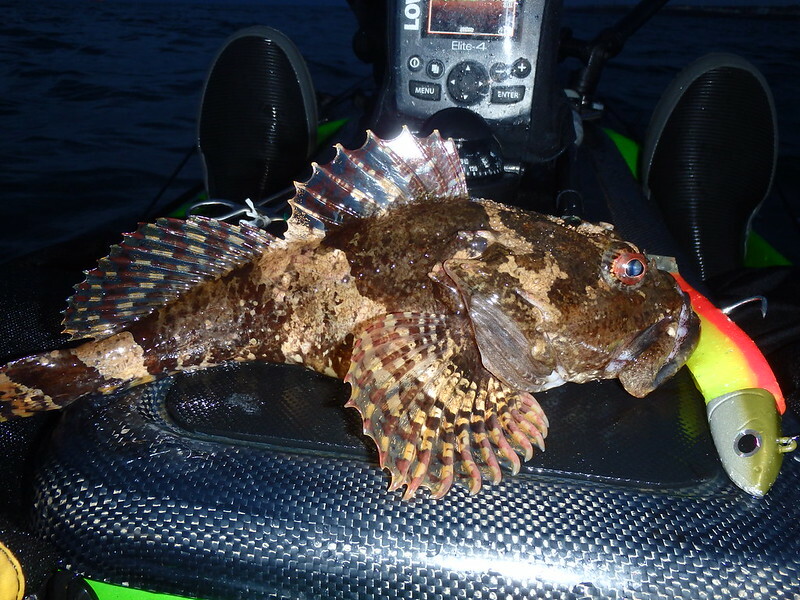 The light was fading so I paddled close to my launch spot and got a strange take to find a very greedy but good size scorpion fish. Species 3 done. 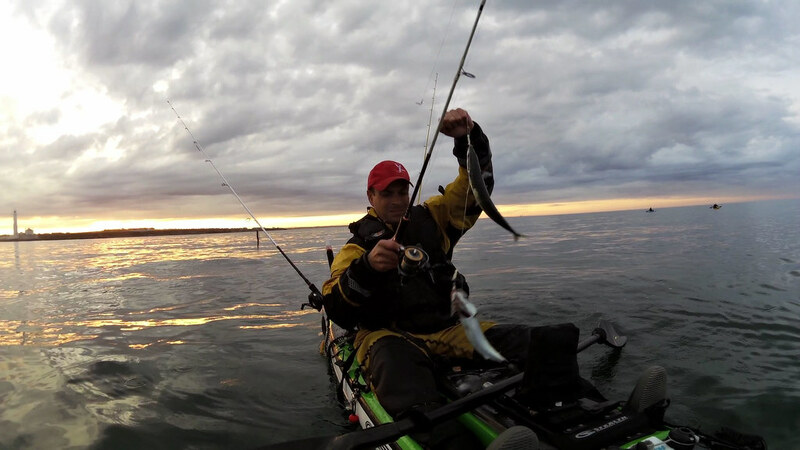 A shoal of mackerel showed up on the finder so a quick drop of a toby lure and species 4 was under my belt. 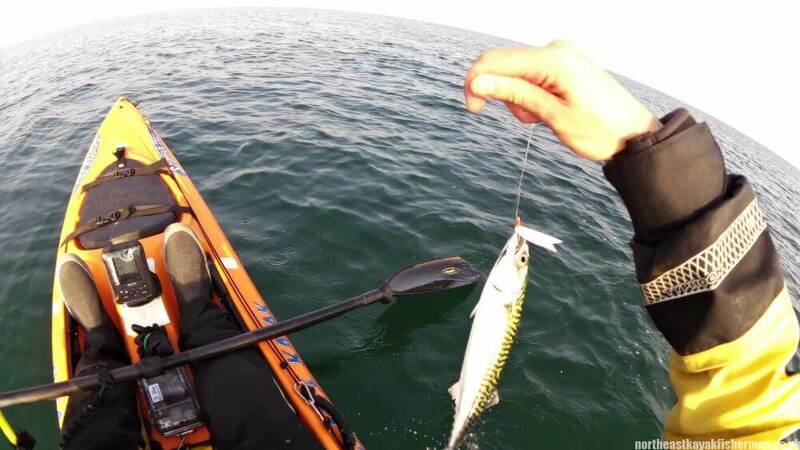 I then tried for another mackerel to find myself catching a bit of weed (or so I thought). 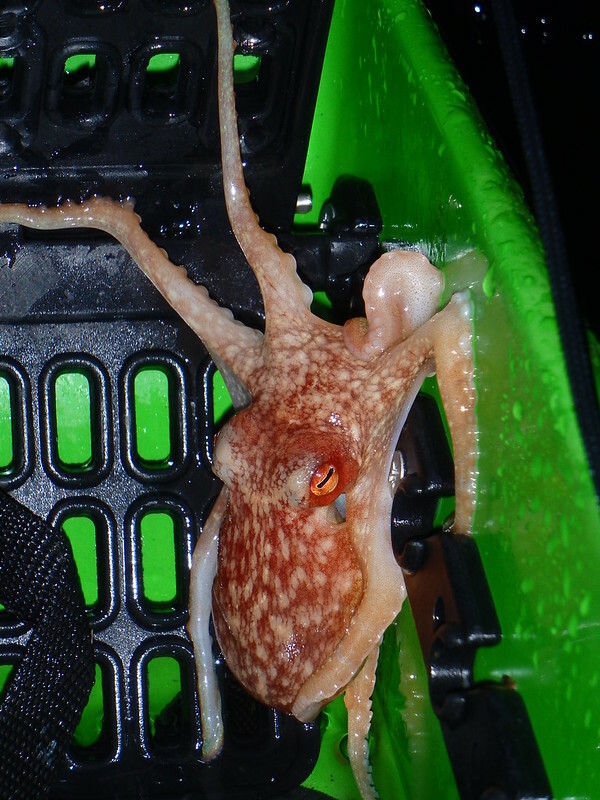 I wound in to find a small octopus attached. This little fellow kept me very entertained. I pondered how to get the hook out and then watched it regurgitate the hook itself. I then pondered how to get it back in the water. At this point it was well and truly suckered to the lid of my hatch. A photo opportunity I thought as it then worked its way to my foot well. After a few pics it then decided enough was enough and suckered its way to the edge and plopped back into the sea by itself. These are seriously smart creatures. The little octopus was my highlight. 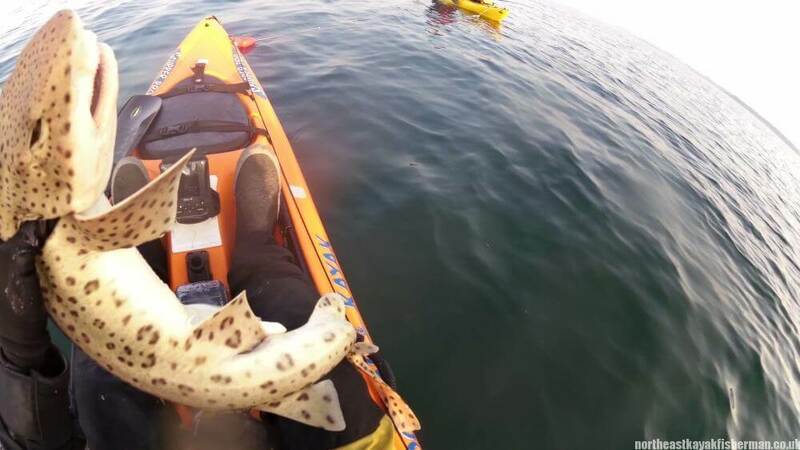 It was then time to paddle back in. 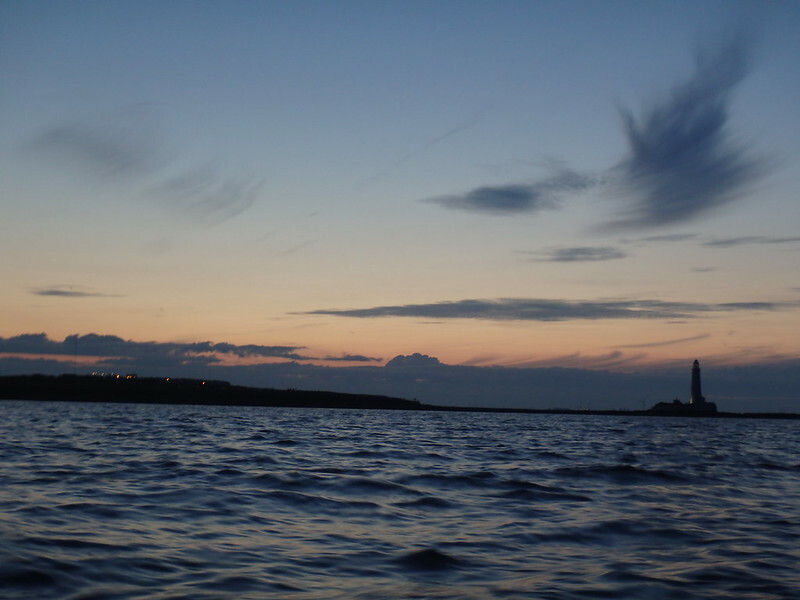 Another quick trip out at Whitley Bay last night. I would have been out late afternoon if it weren’t for the bloomin wind that was stronger than predicted. It was still stronger than I would have liked at 7pm but manageable with a drogue. 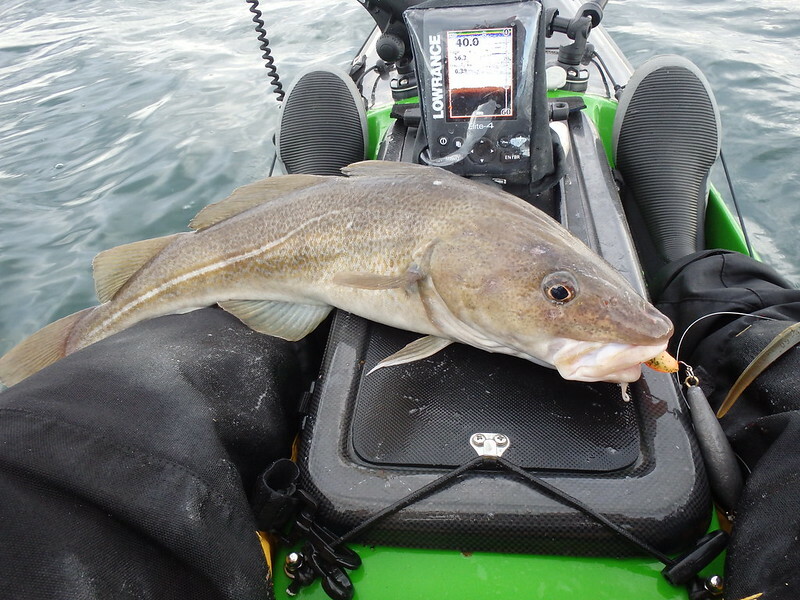 Cod fishing was a bit slower than last time although there were still a nice stamp of fish around. I tried and tried for pollock but couldn’t hook any this time. Plenty chasing the lure half way up the water column but only tentative plucks. 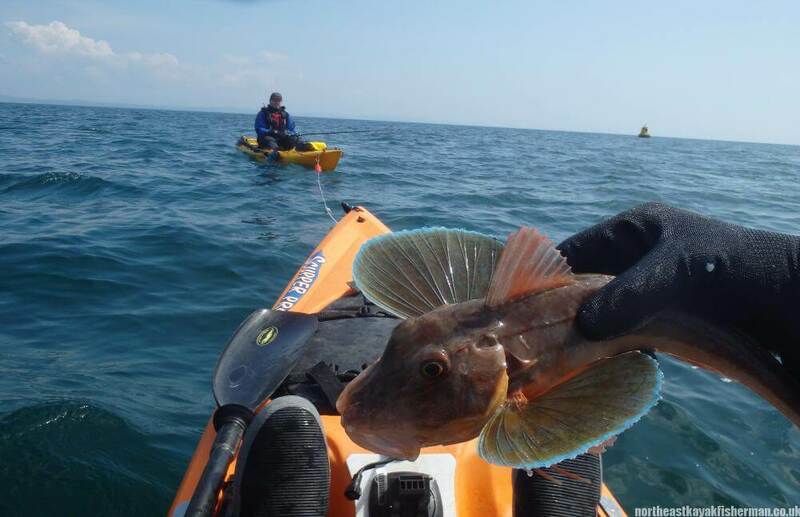 I have marked a couple of lovely deep kelp shelves so hopefully in the next month or so….. The weedless shad on the bottom of an inline sinker that I wrote about earlier took all the bigger cod today so definitely seems to be working. 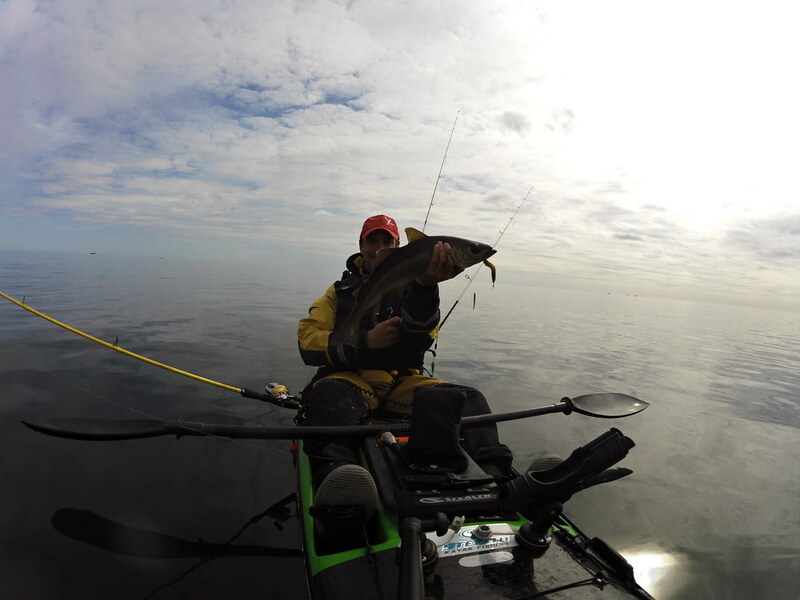 I managed a cheeky session at Blyth this morning. We have been trying to get our 11 month old son Noah off the expensive pureed foods ‘Elas’ with very little joy until a couple of days ago when he ate a lightly battered fillet of plaice. He loved it 🙂 The only problem was I didn’t have any more left in the freezer so my mission was to catch some more flatties. 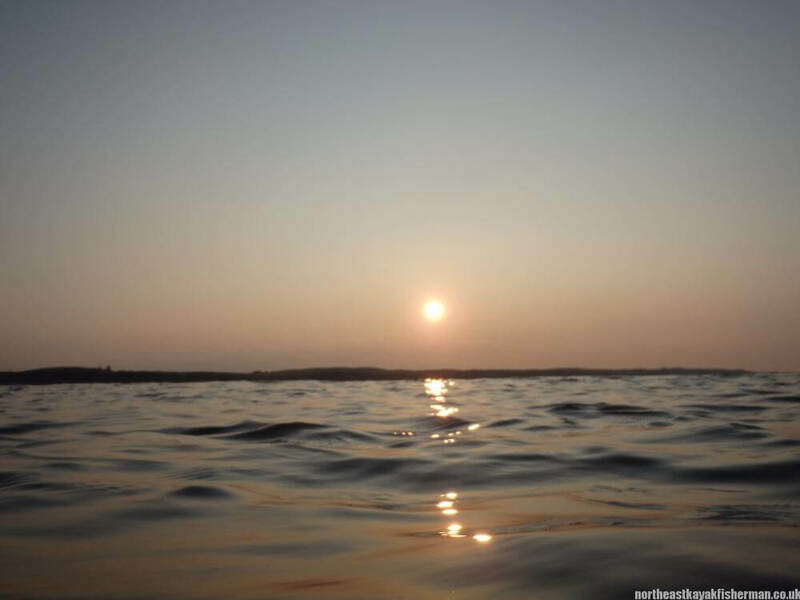 I paddled out around 6am this morning and there was hardly any wind. At first I did a bit of exploring and found the inshore wreck in the middle of the bay. For those that fish the area, does it hold many fish? It seems really close in that I thought it might struggle to be productive. 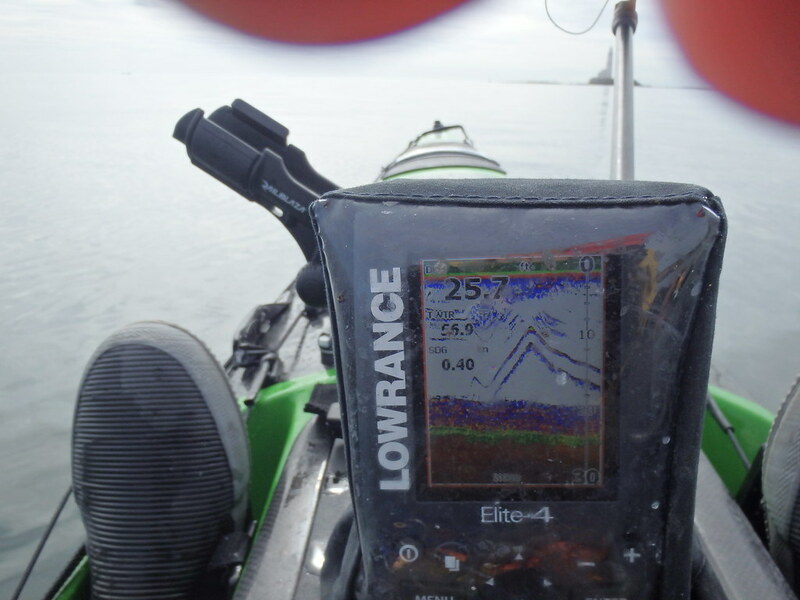 Nothing showed on the fish finder. I did a couple of drifts past it but the wind was getting up by now so I headed a further 50 yards out and anchored up with rag and lug in search of the flatties. I had nothing in the first hour. Not even a bite. I thought this was going the way of many of my sessions (i.e. not very productive) however, about an hour before high tide it all got a bit hectic with both rods shaking away a few times. I didn’t know which one to go for first! 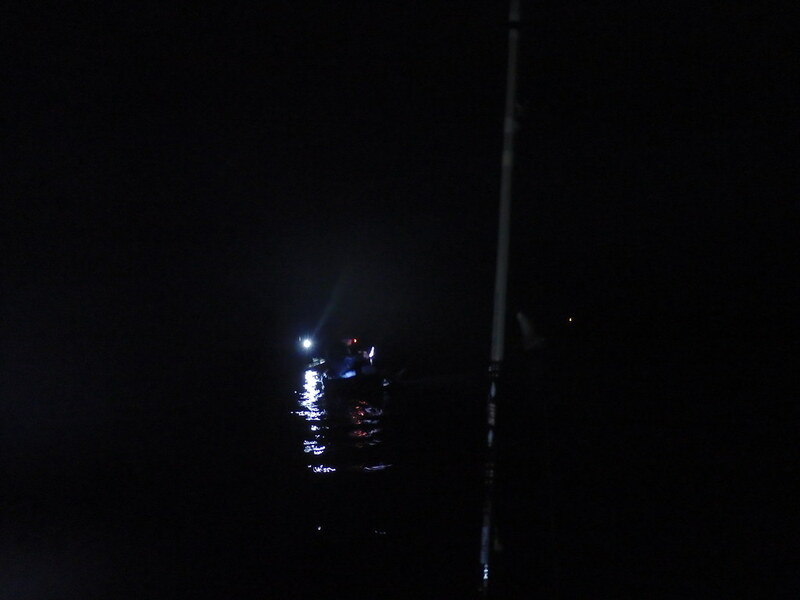 Anyway, within a couple of hours the wind was really starting to pick up so I up-anchored and paddled back in to shore. That should keep Noah happy for a little while.